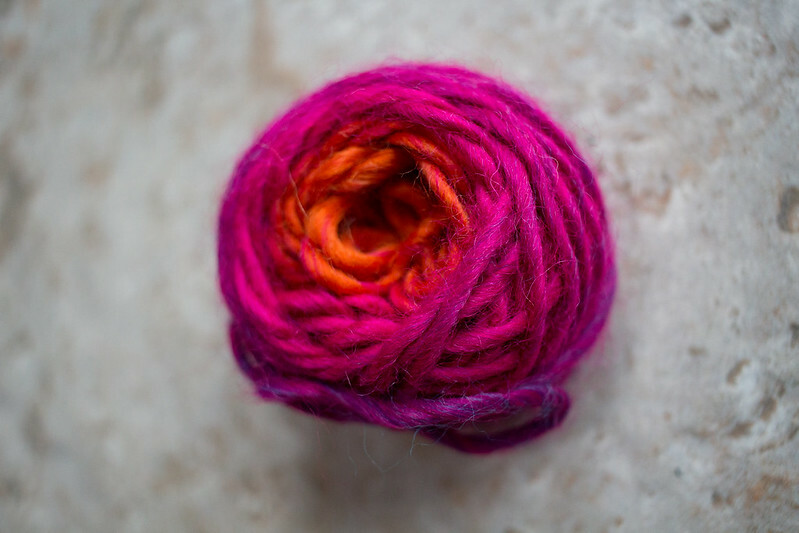 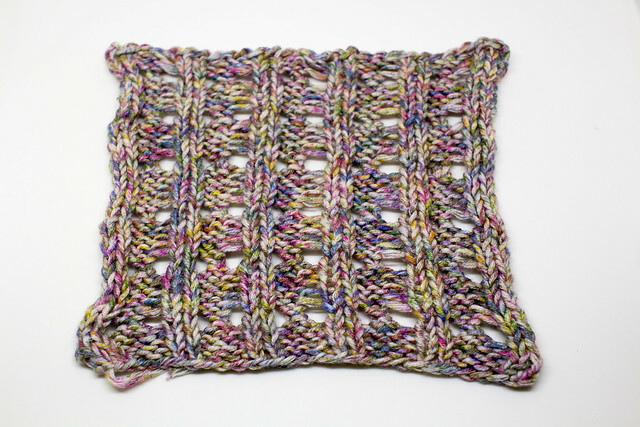 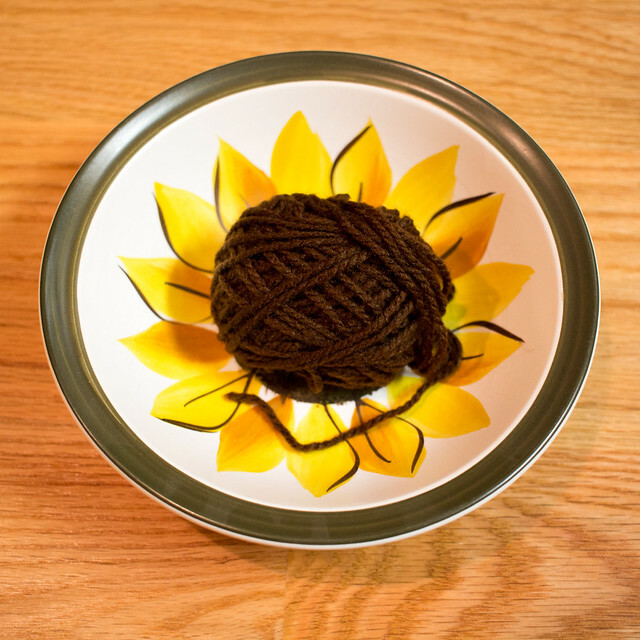 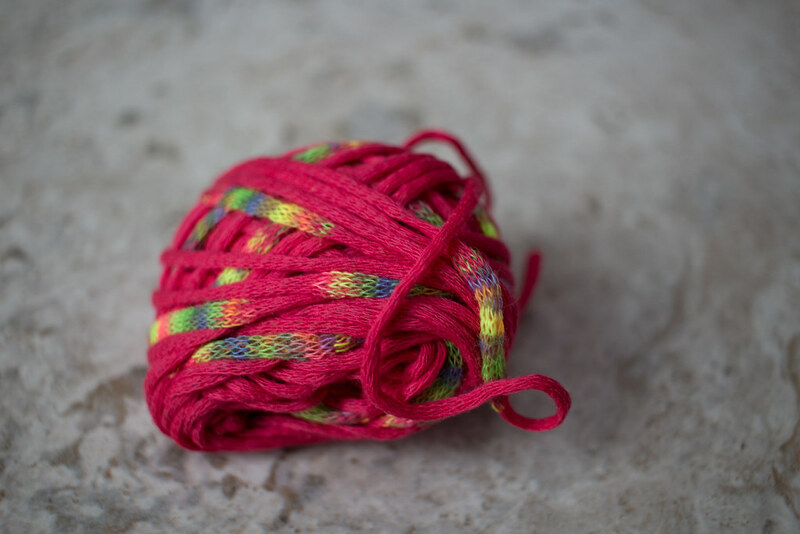 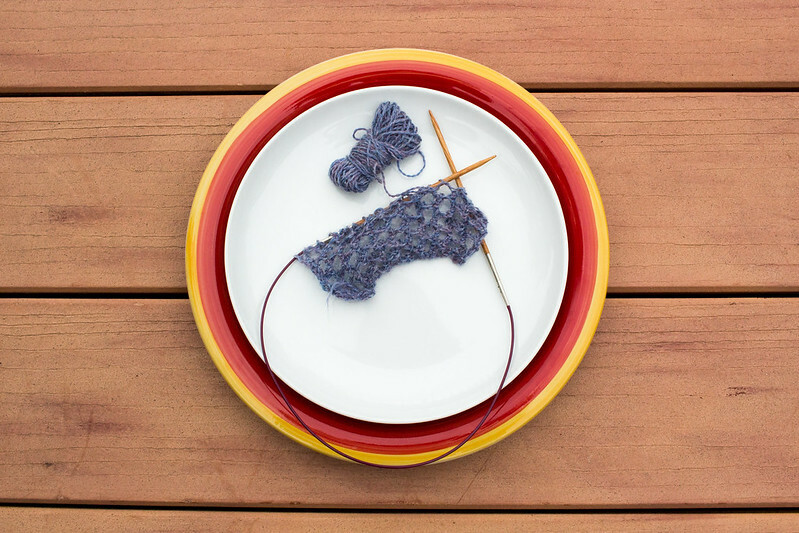 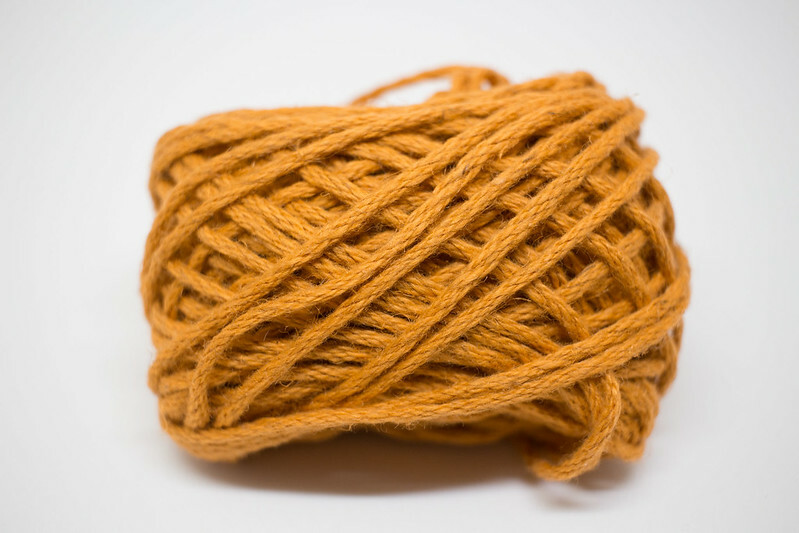 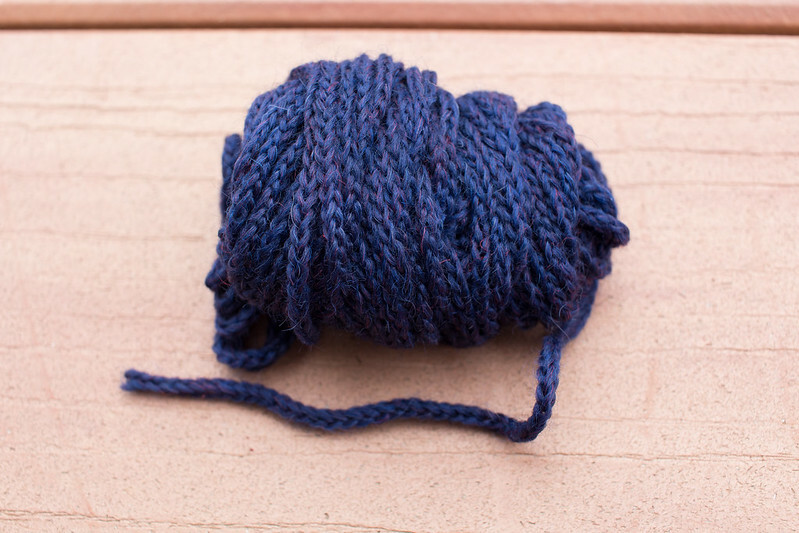 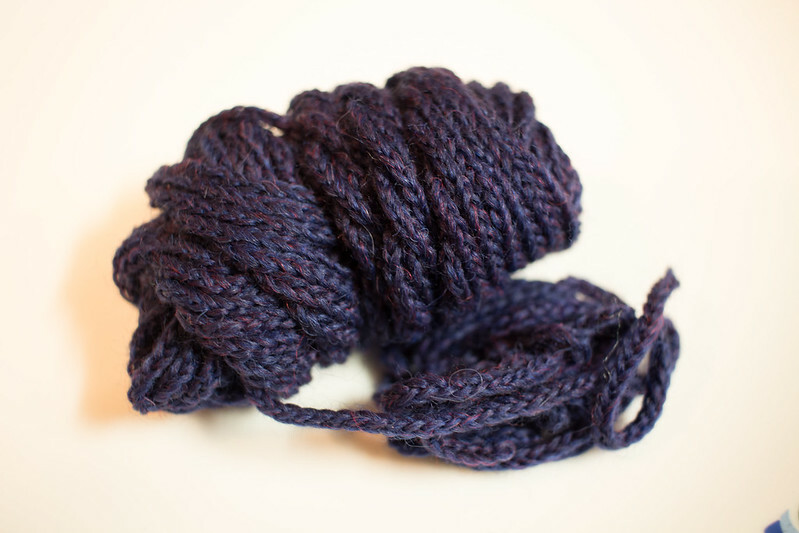 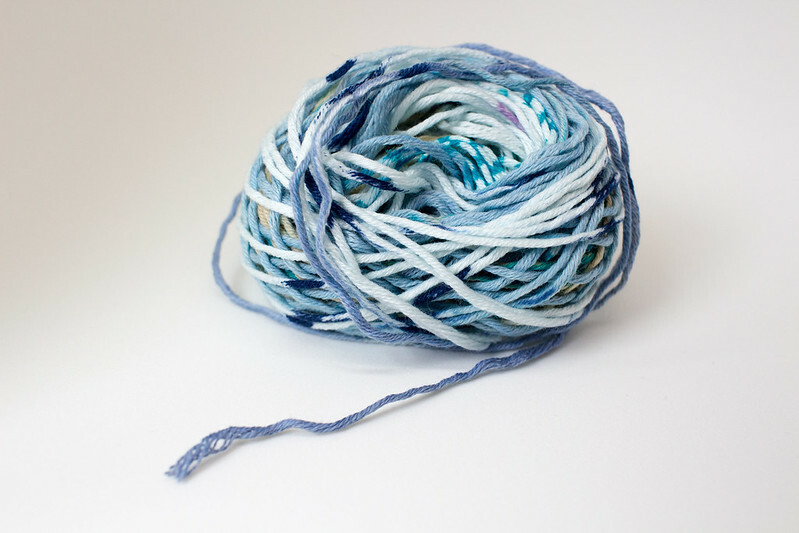 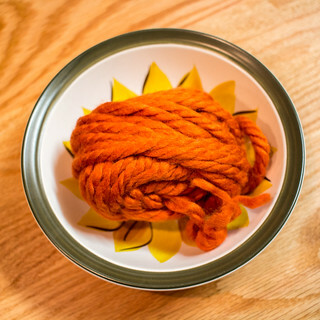 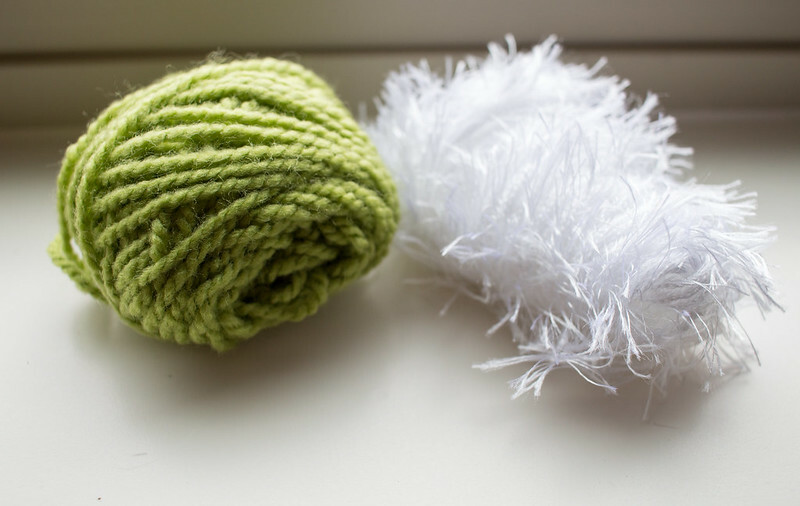 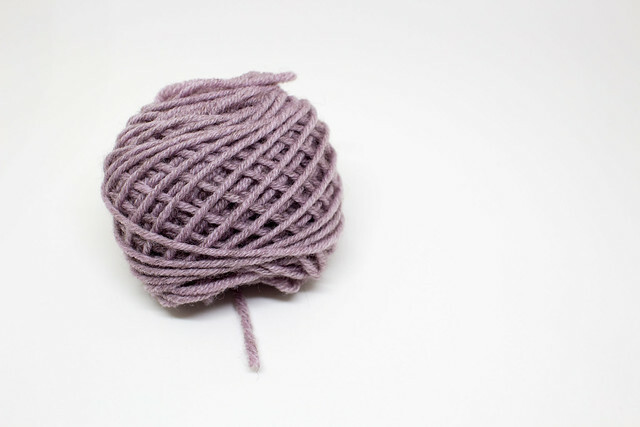 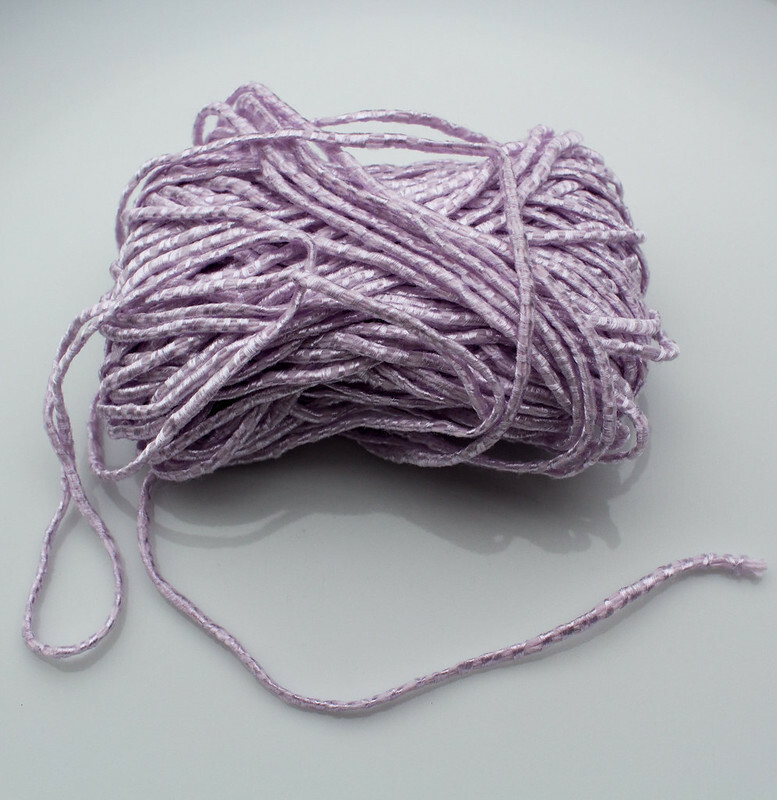 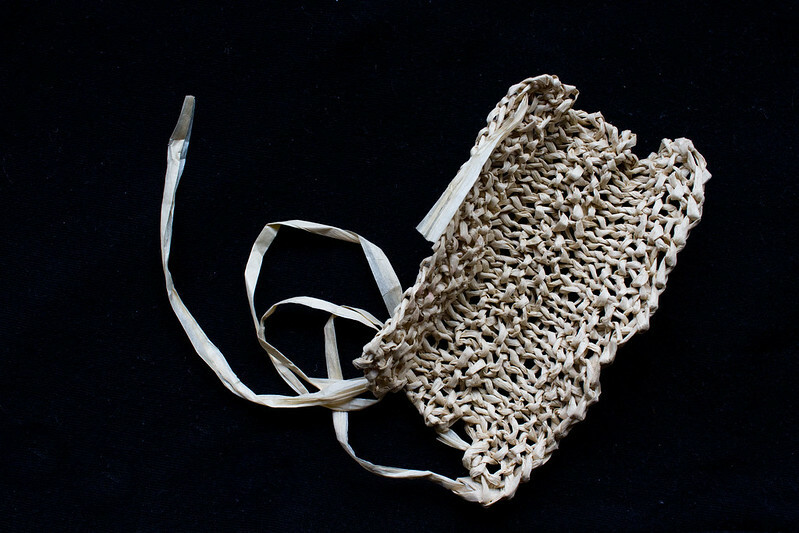 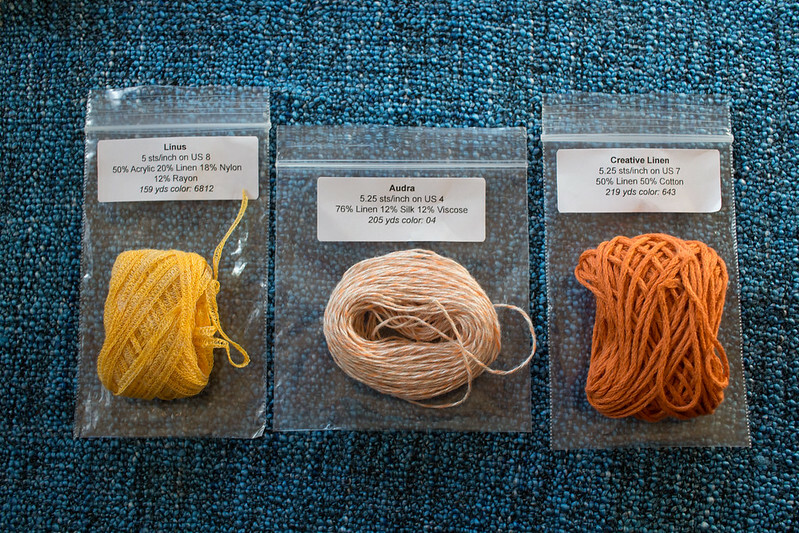 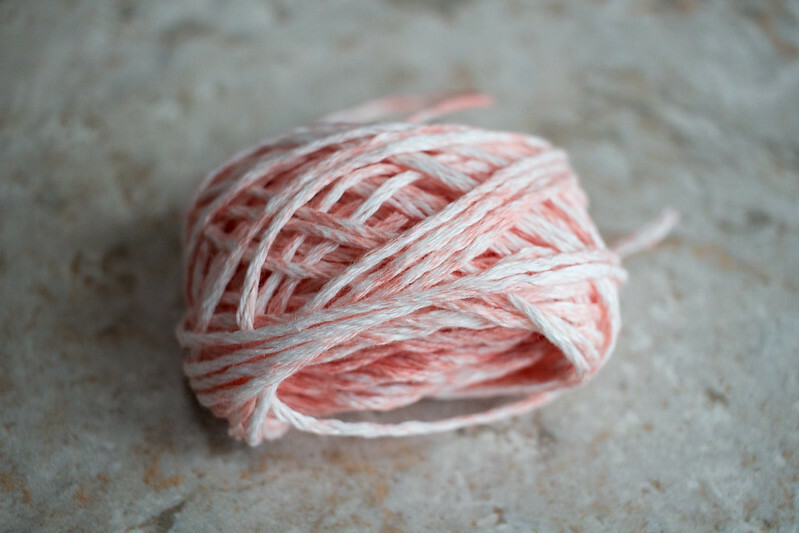 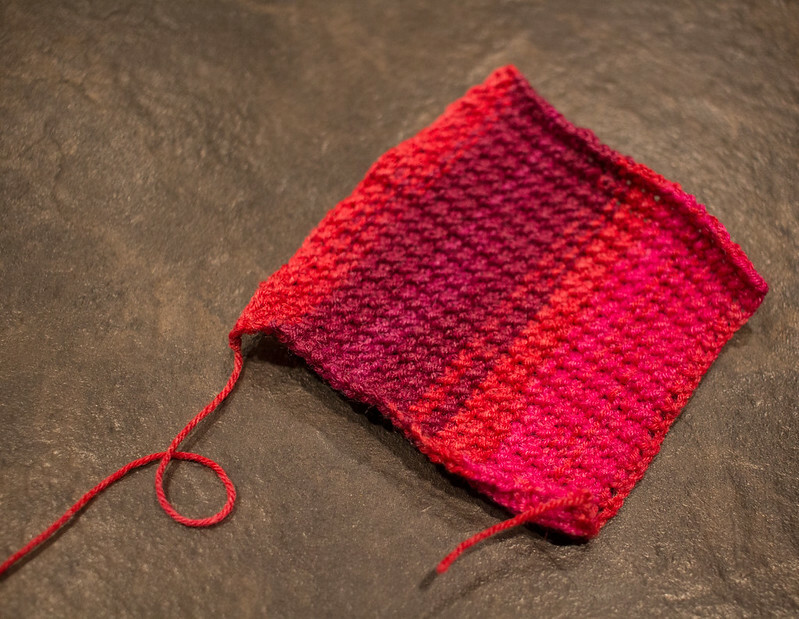 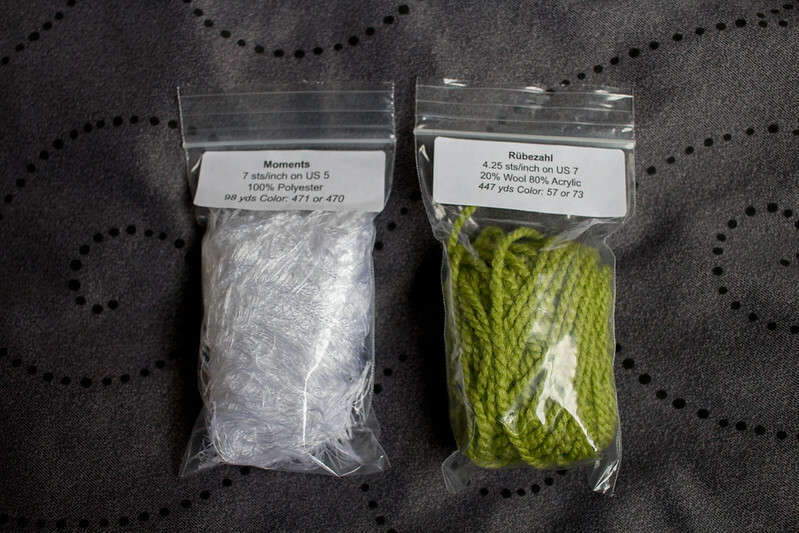 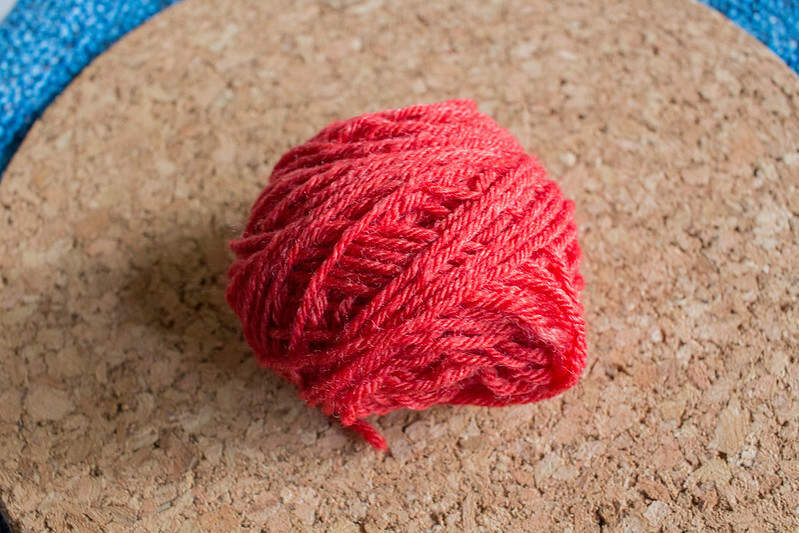 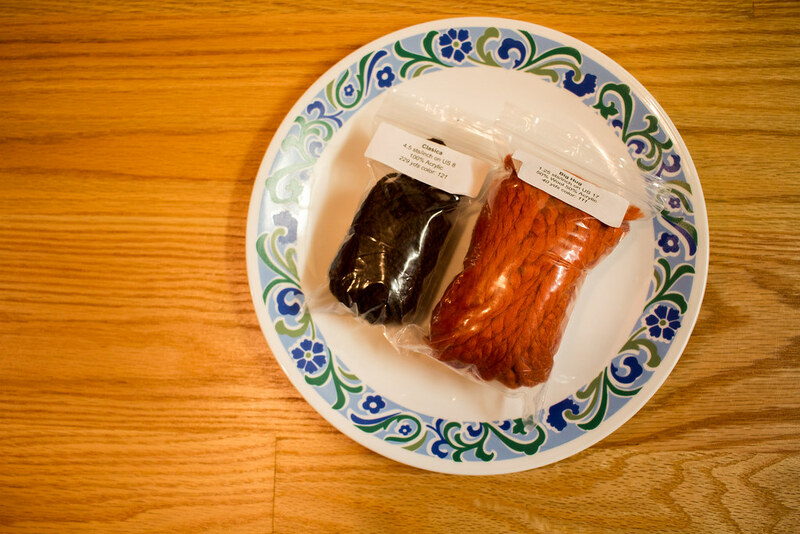 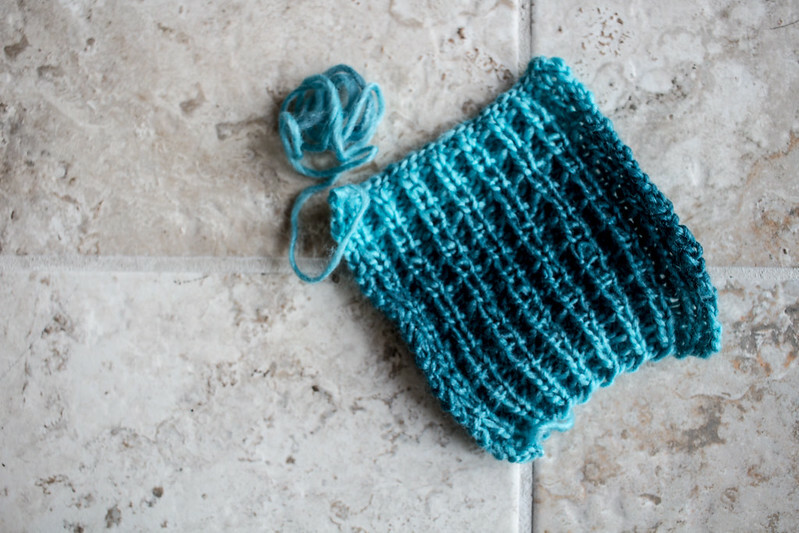 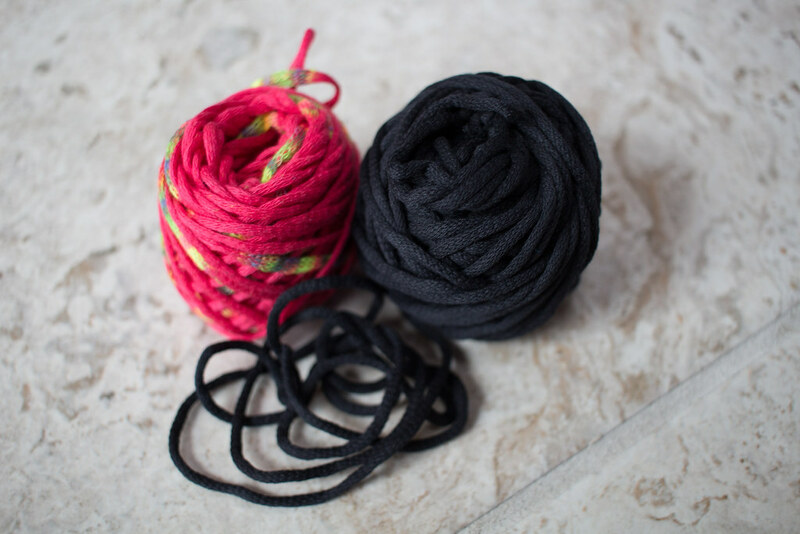 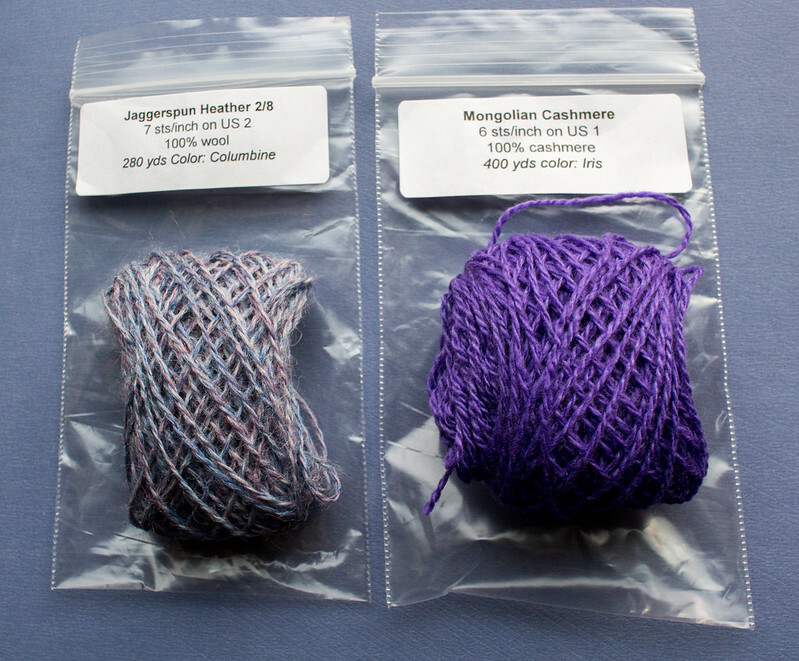 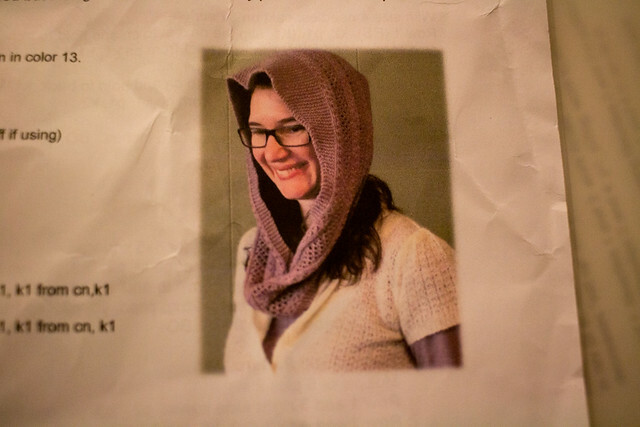 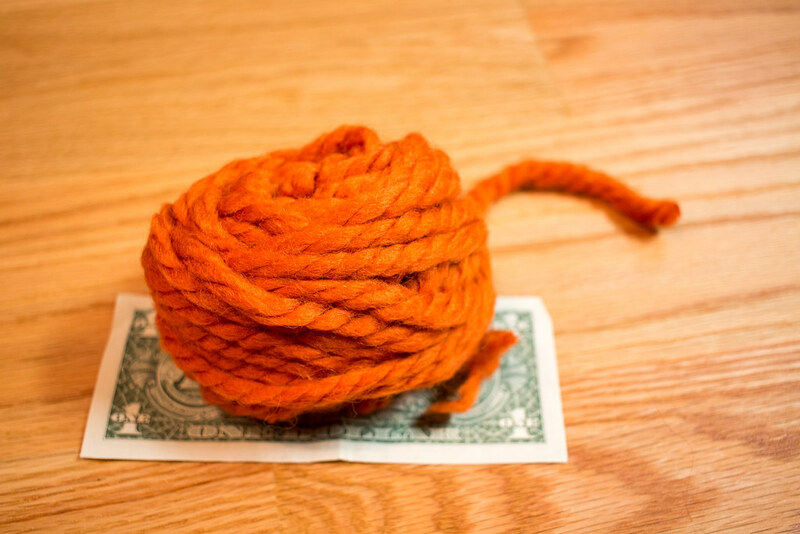 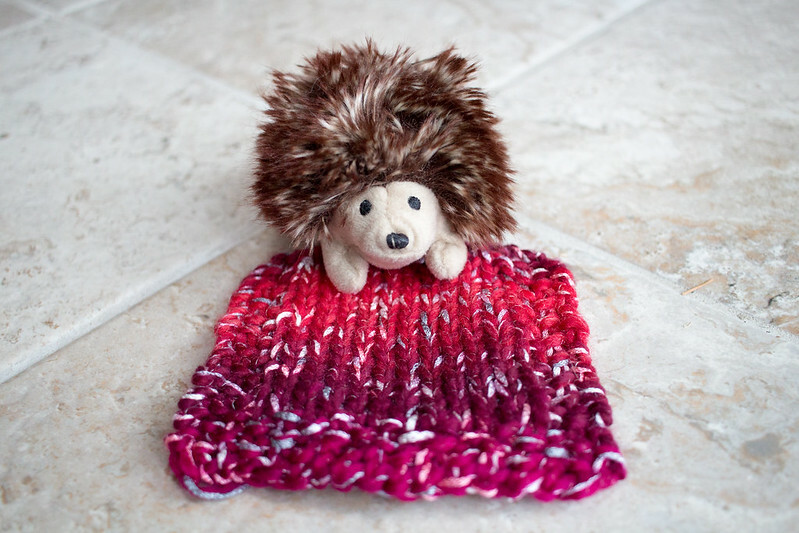 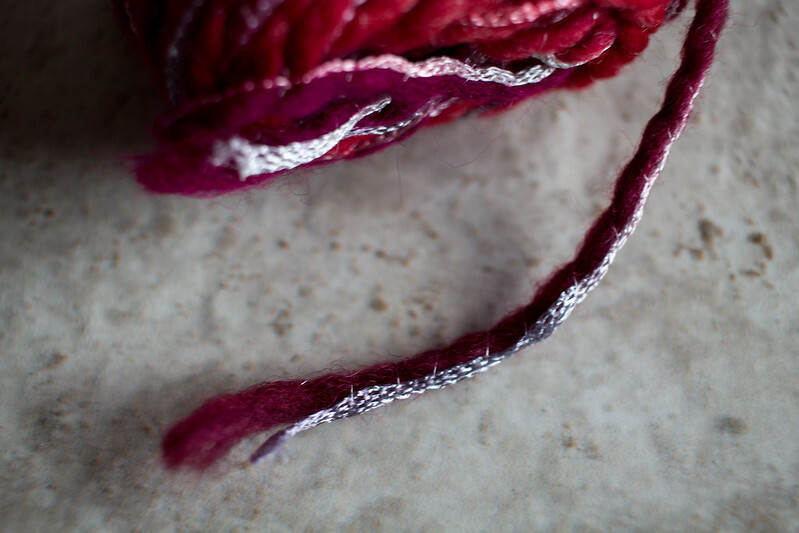 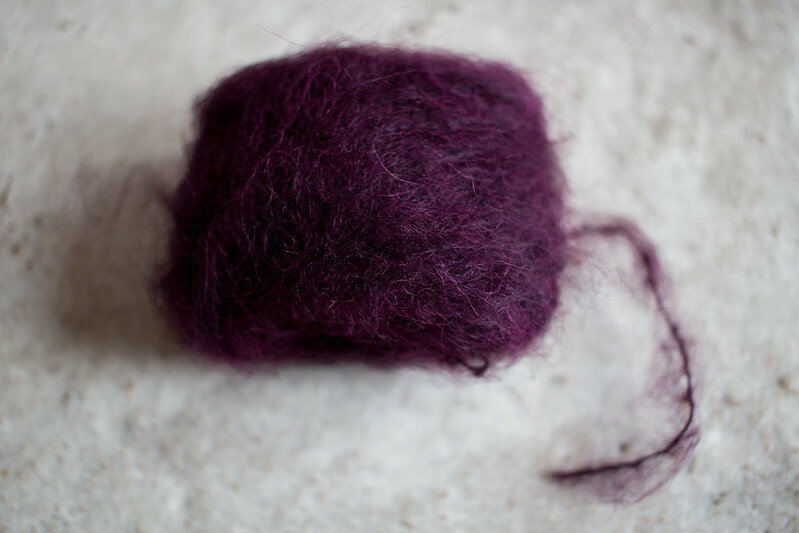 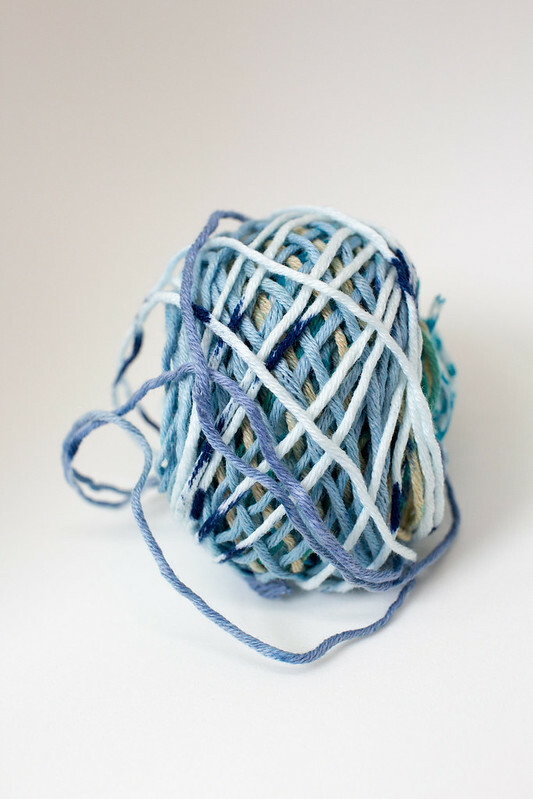 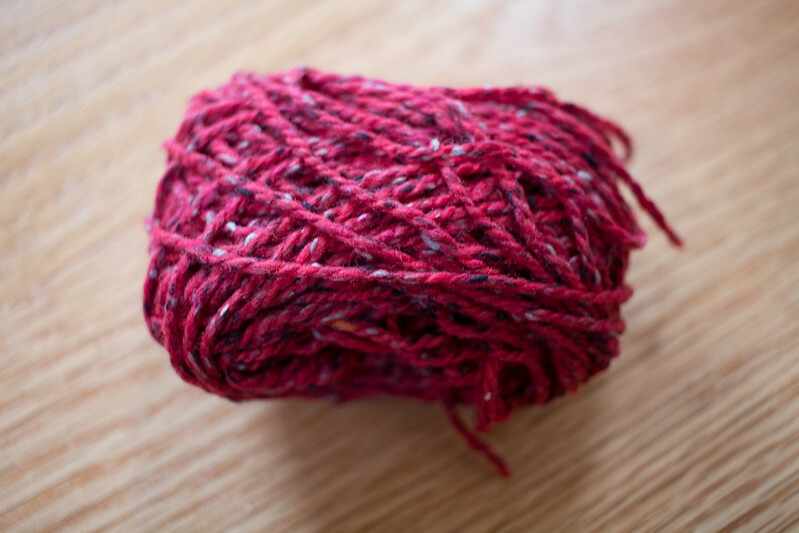 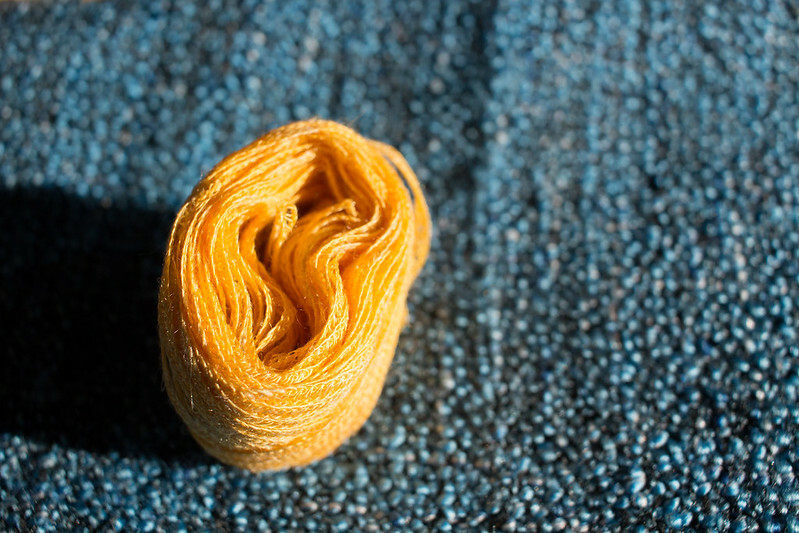 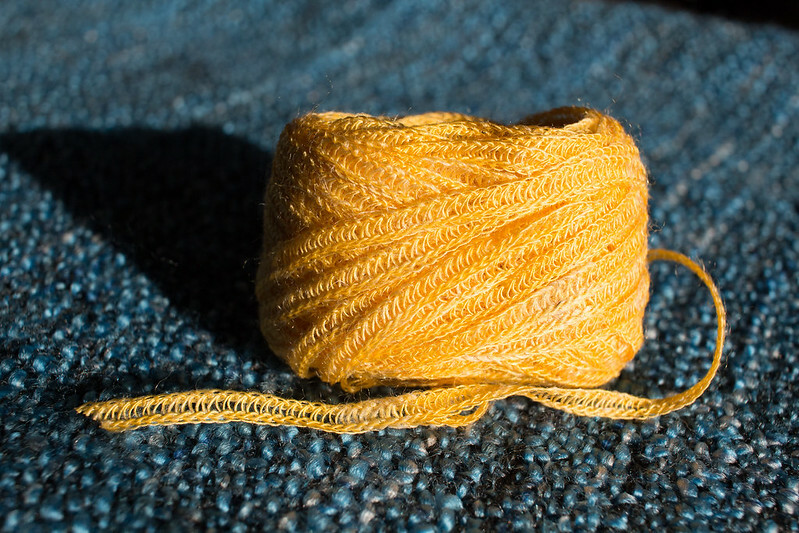 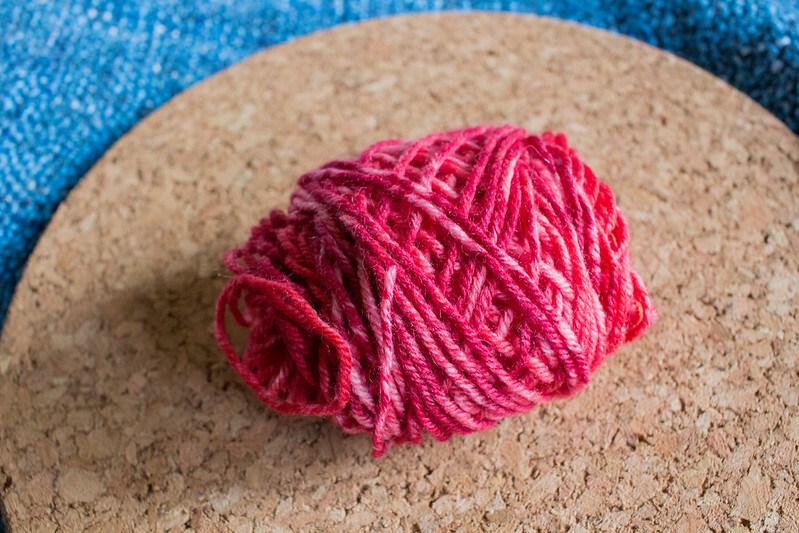 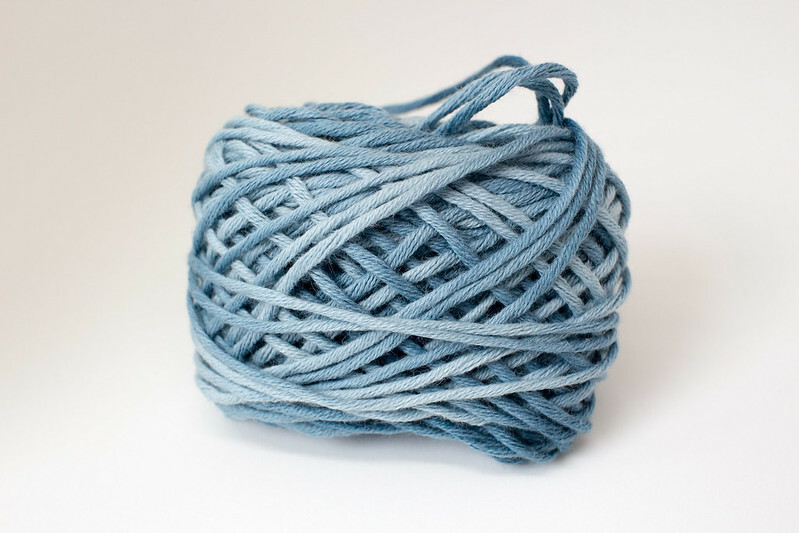 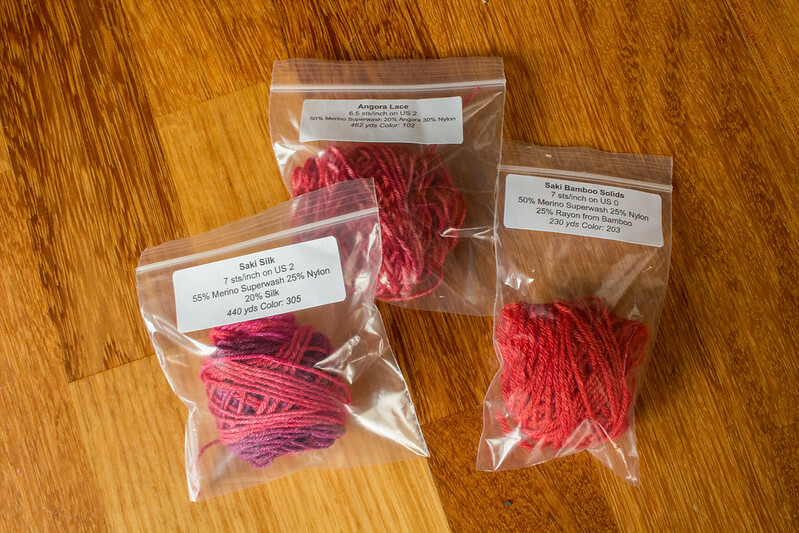 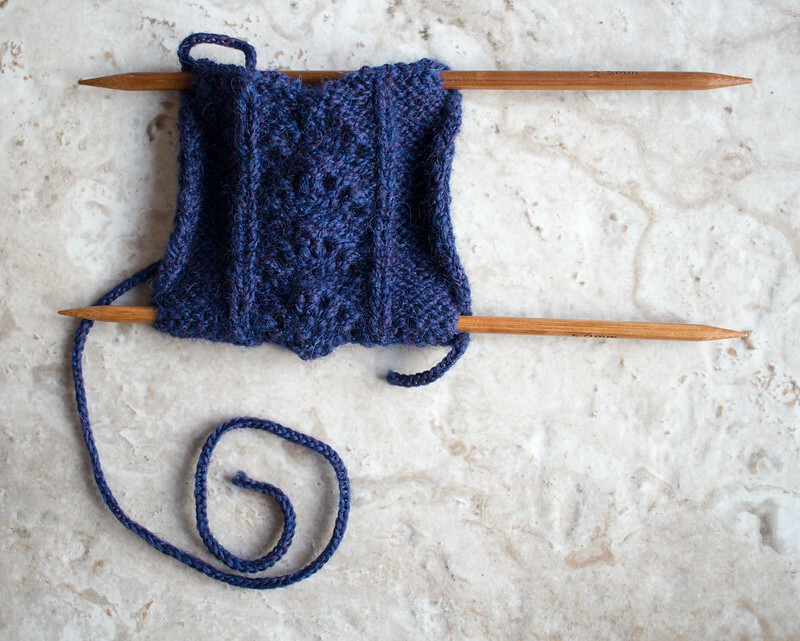 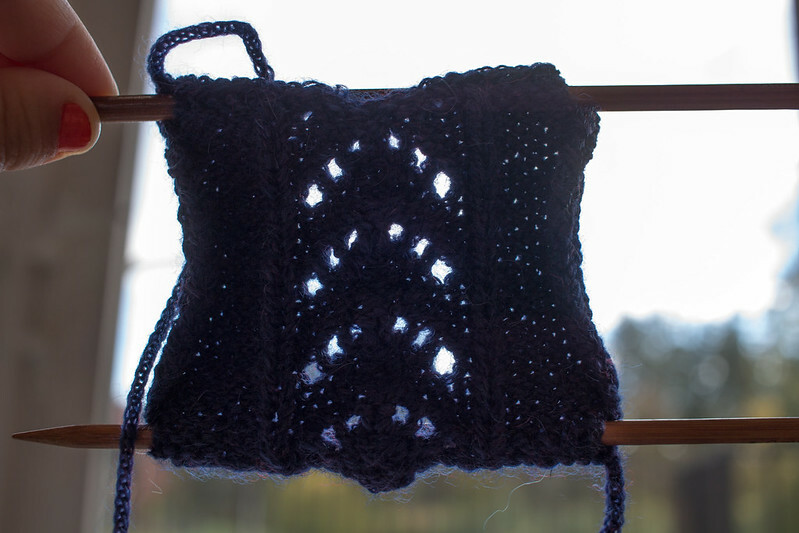 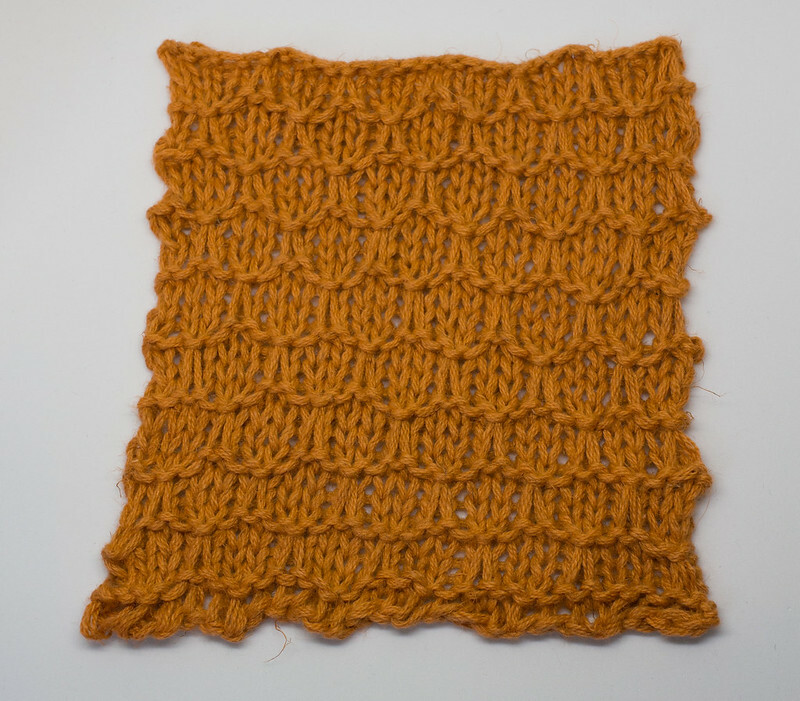 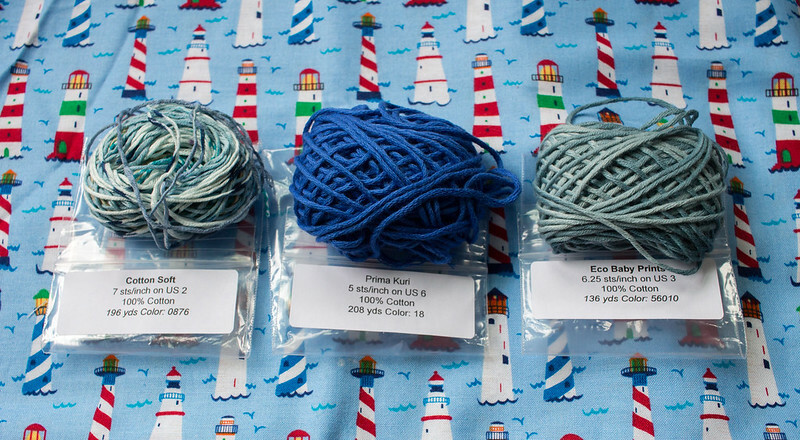 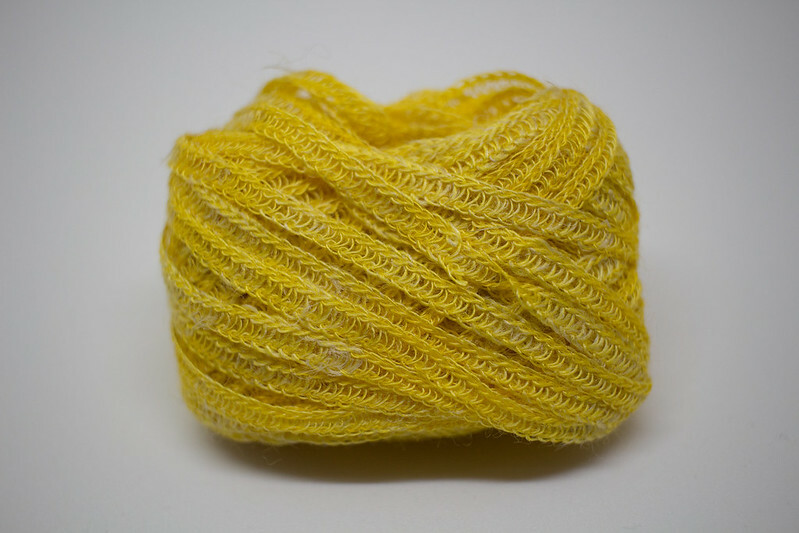 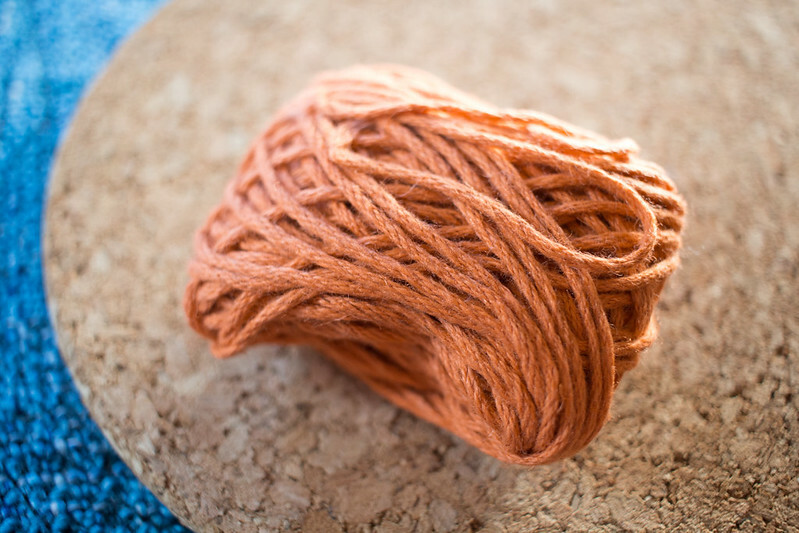 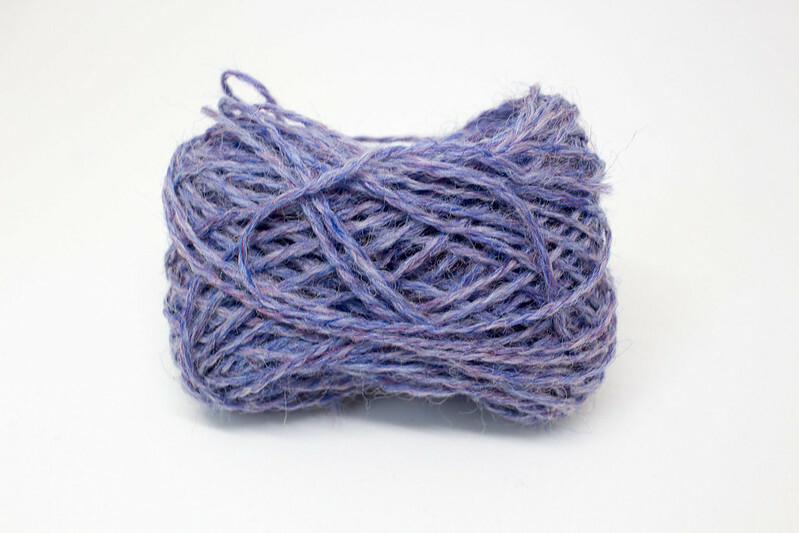 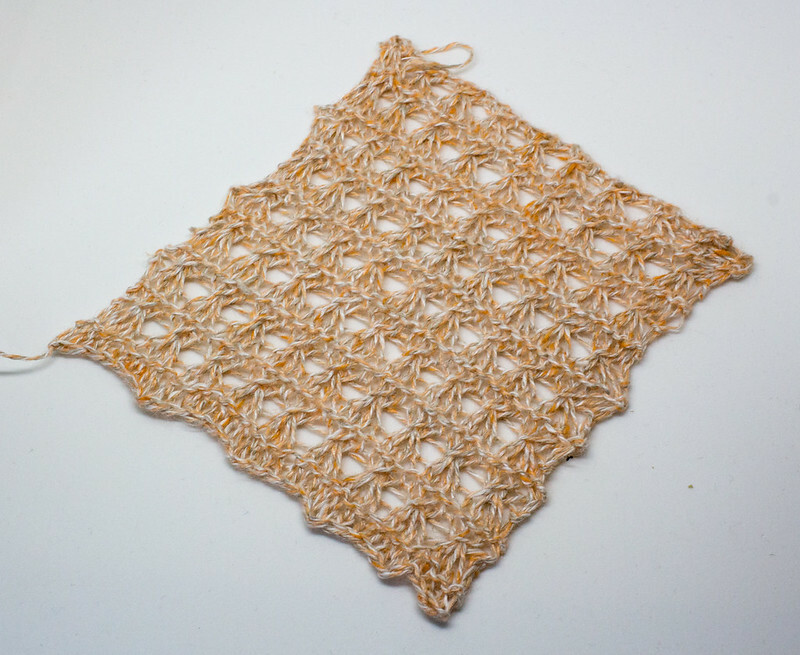 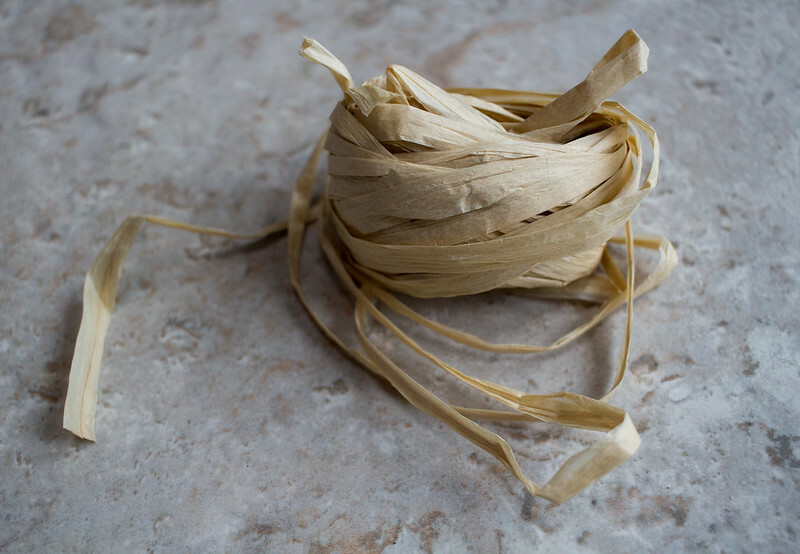 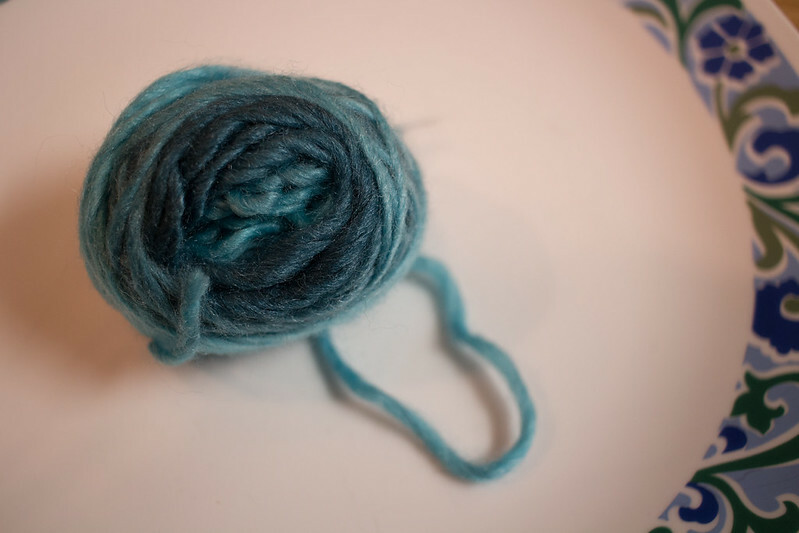 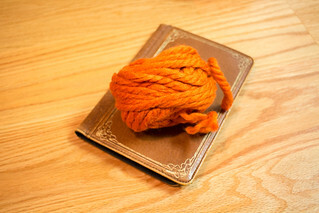 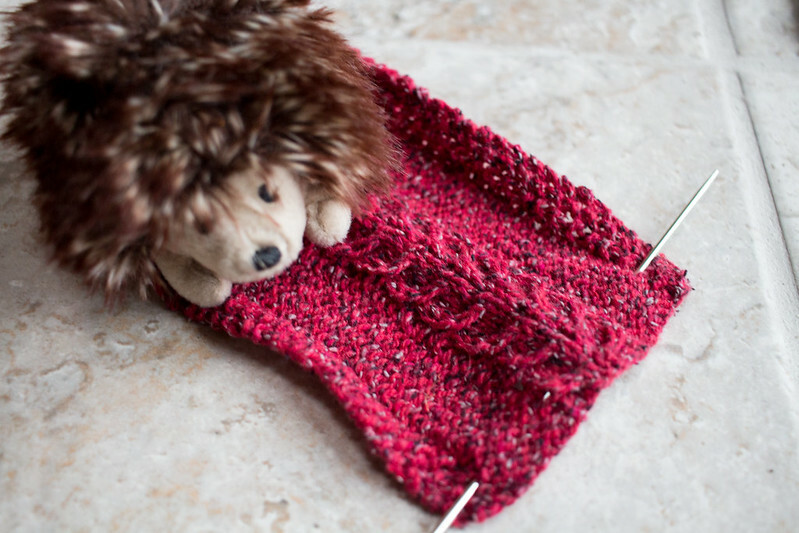 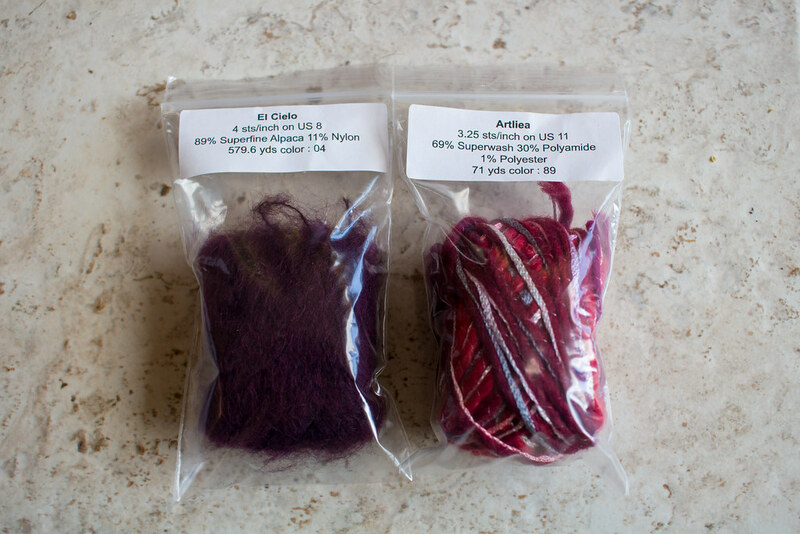 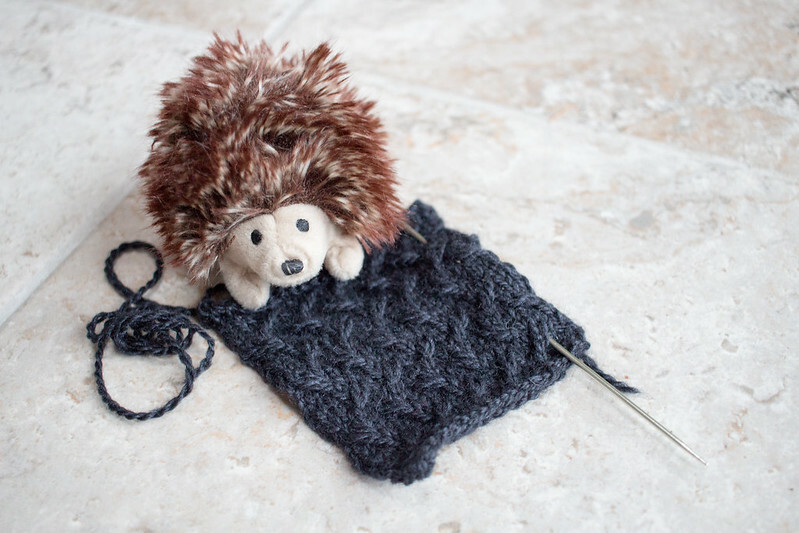 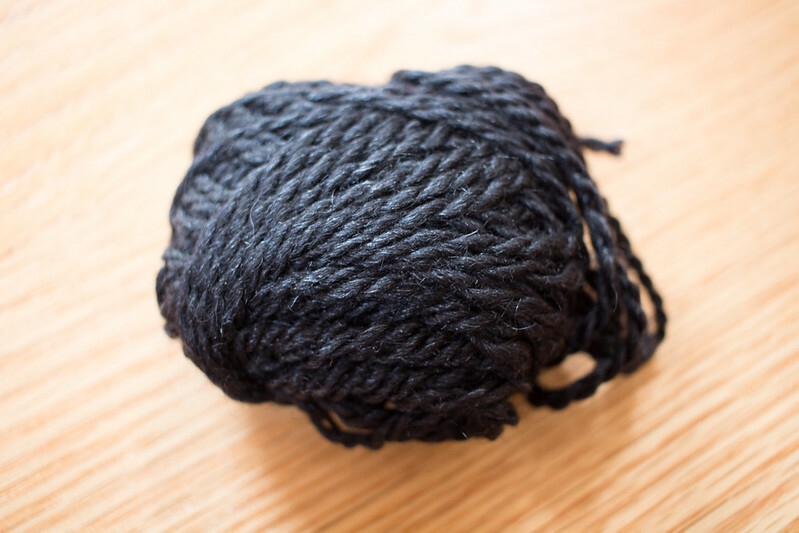 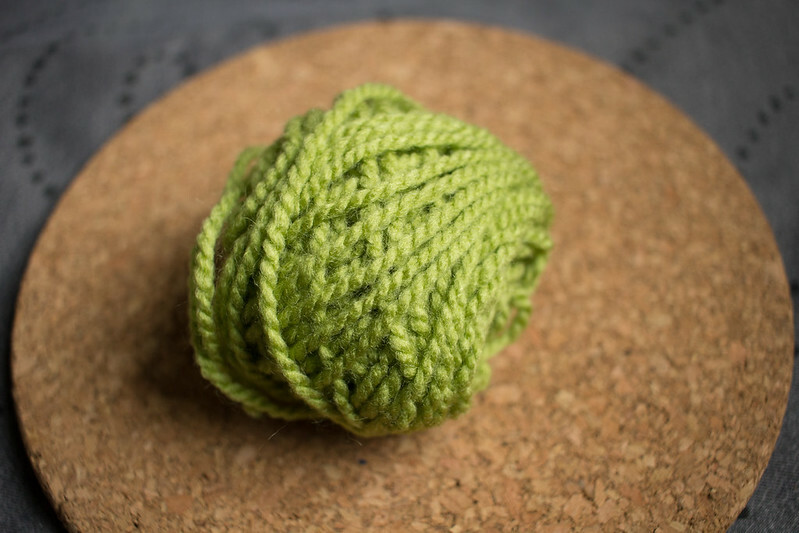 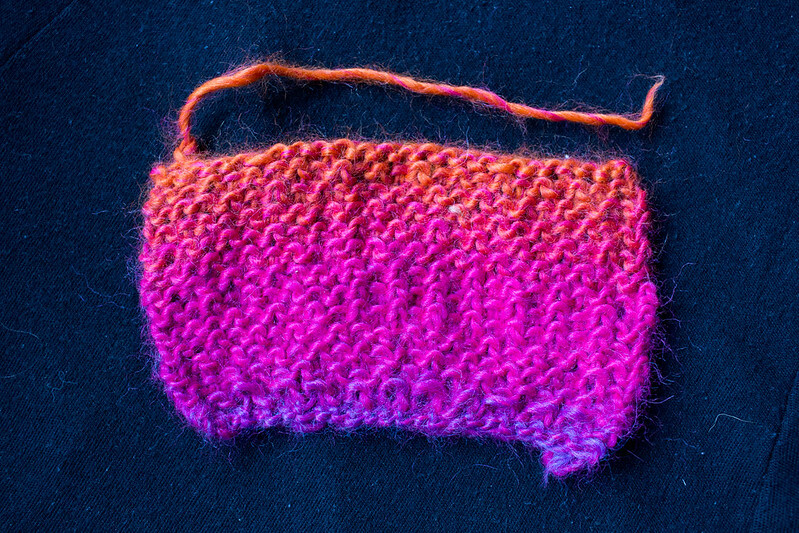 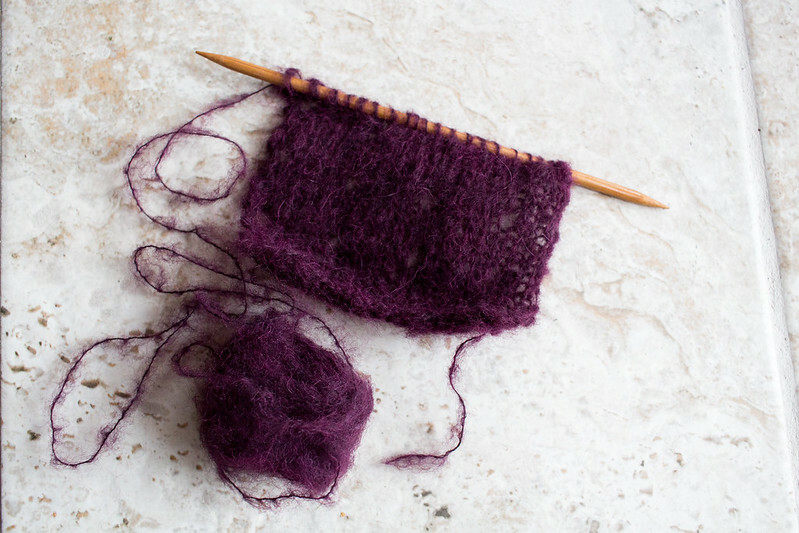 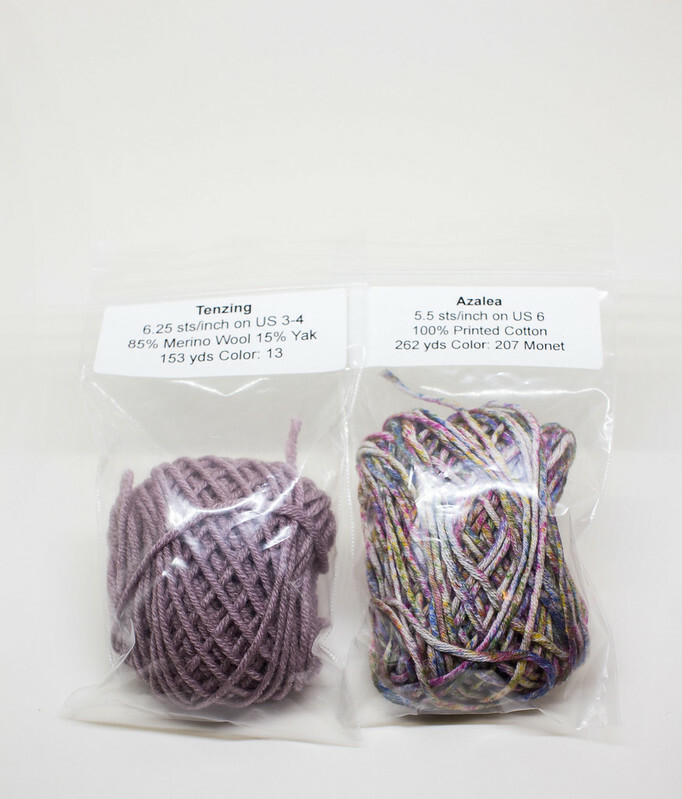 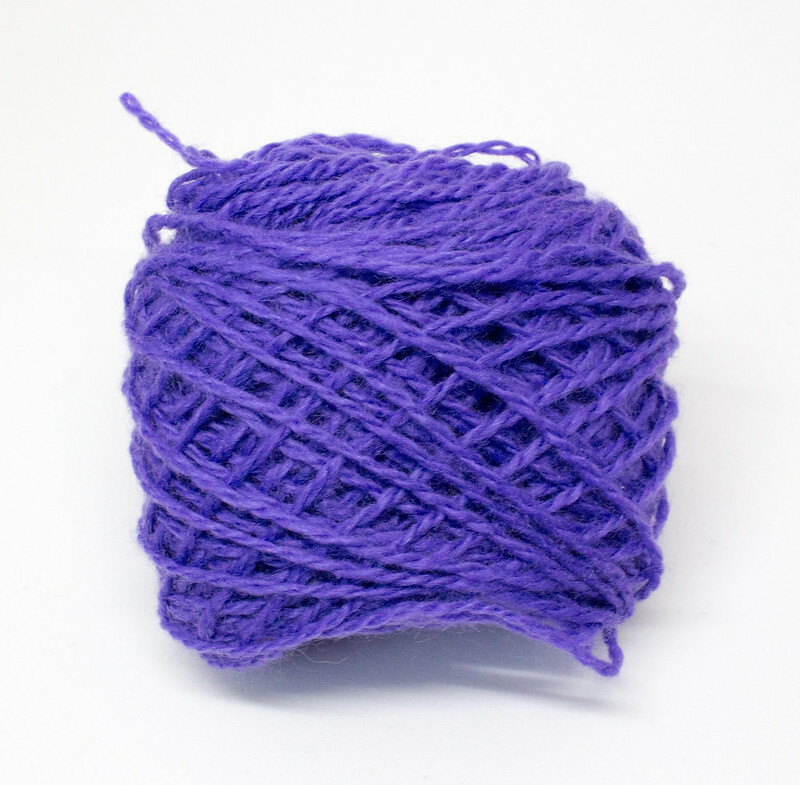 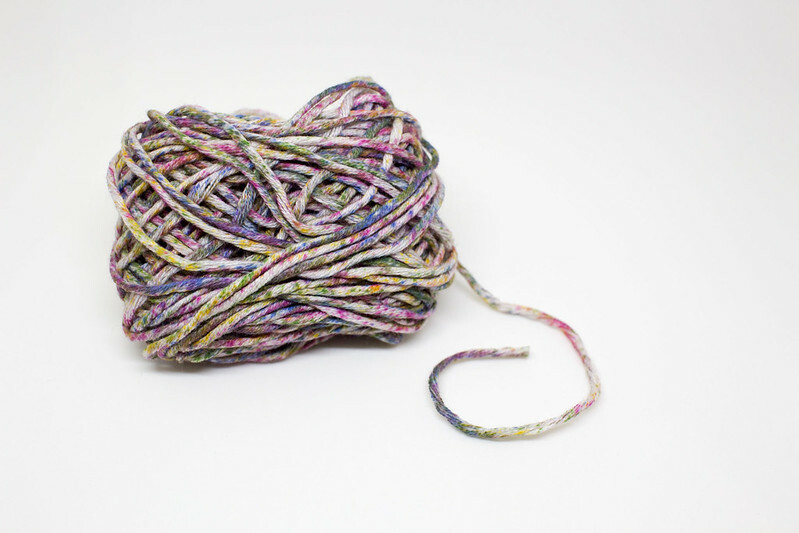 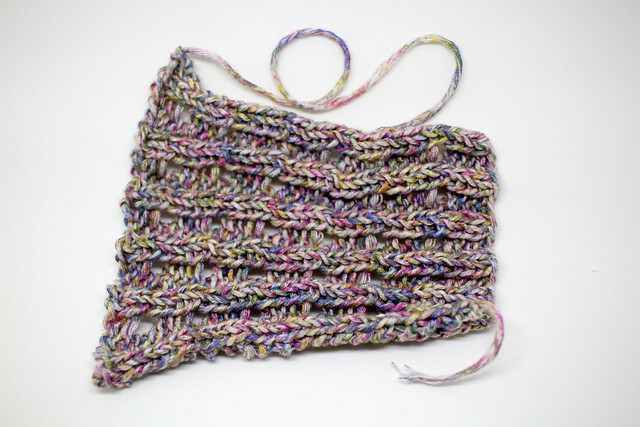 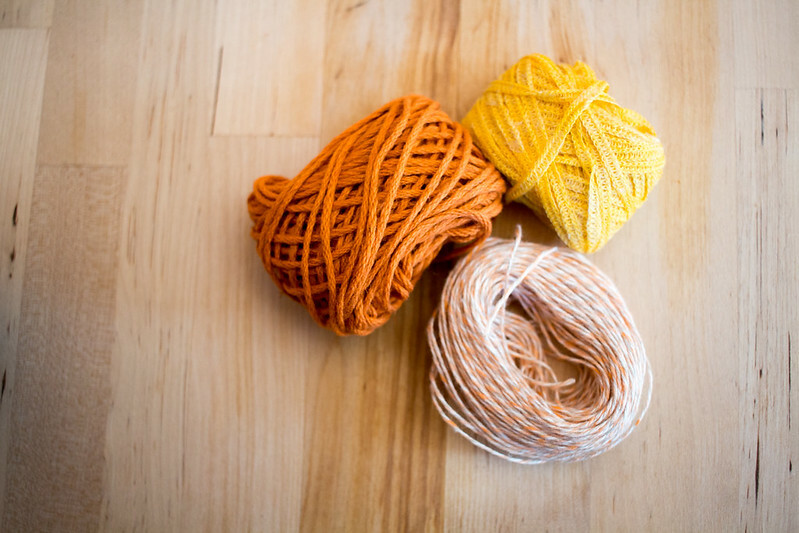 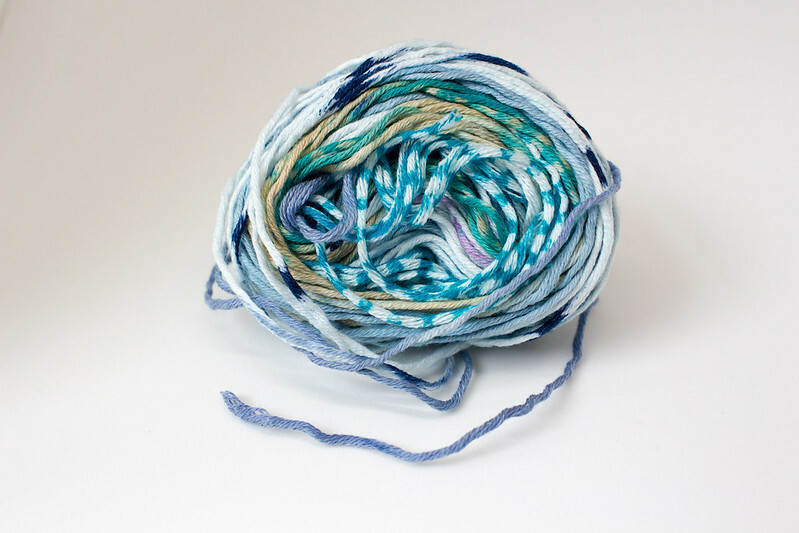 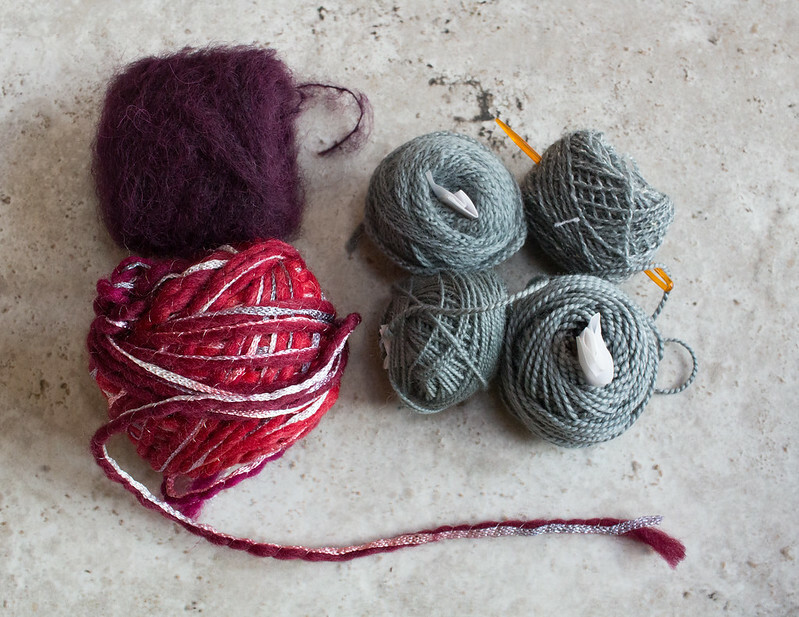 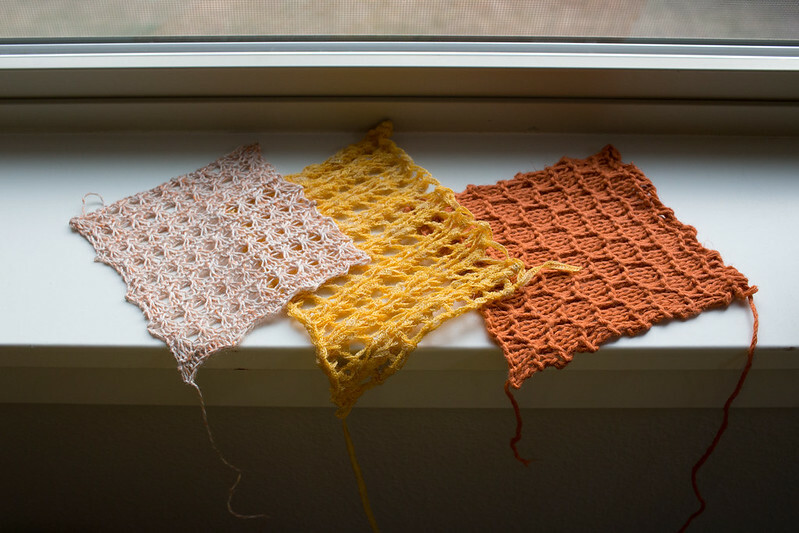 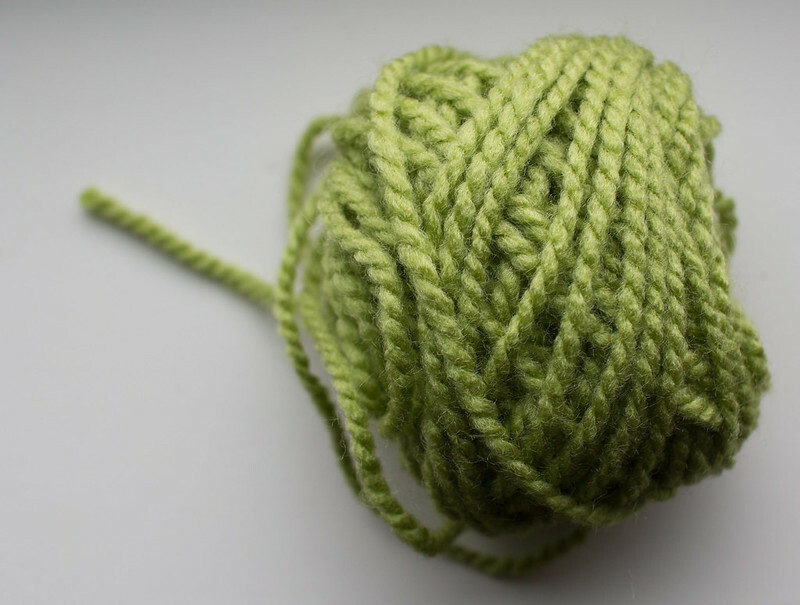 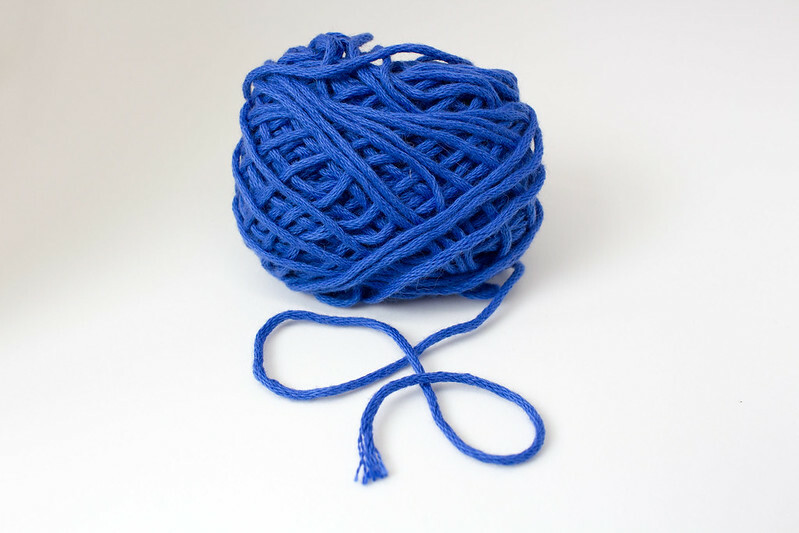 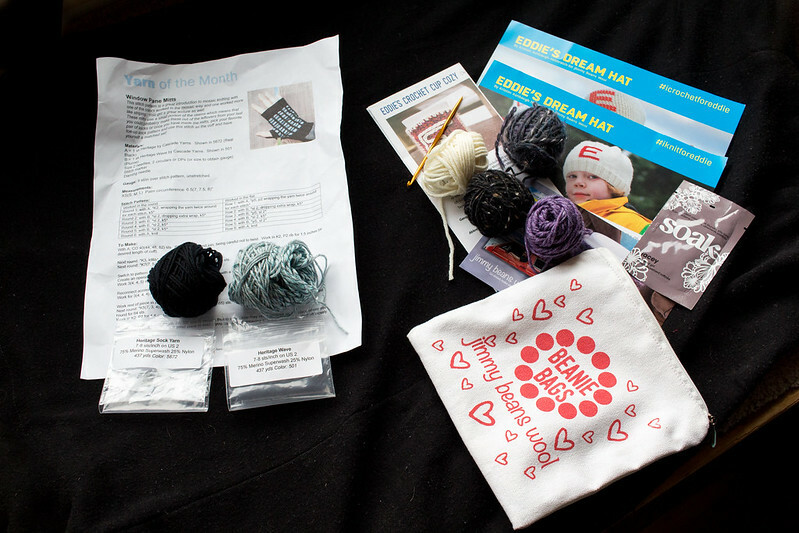 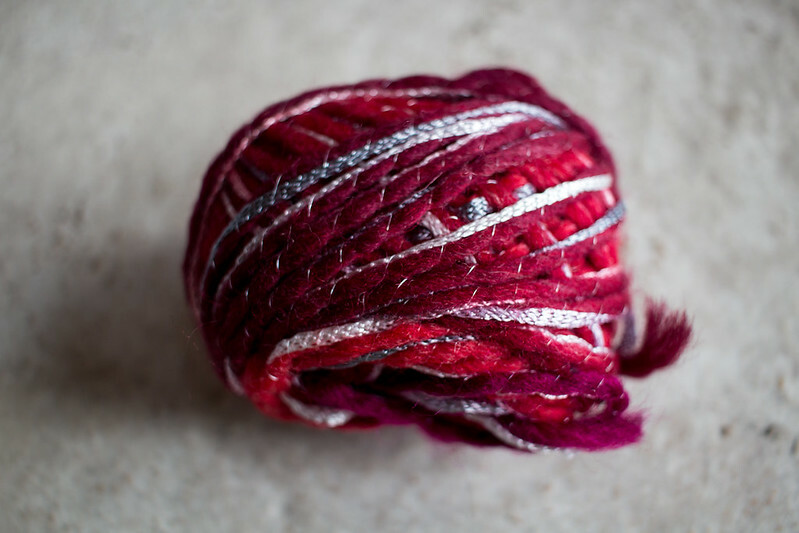 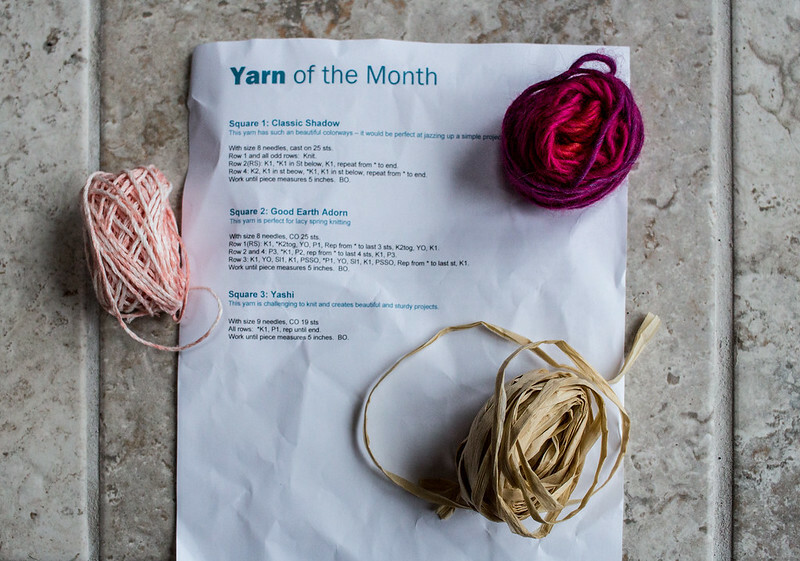 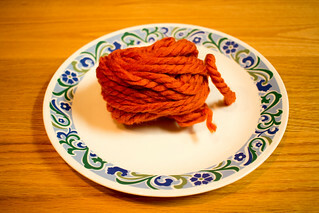 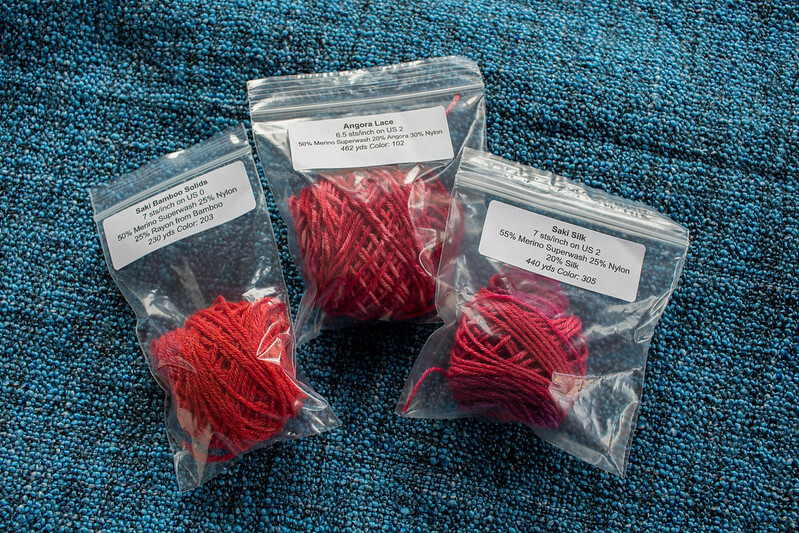 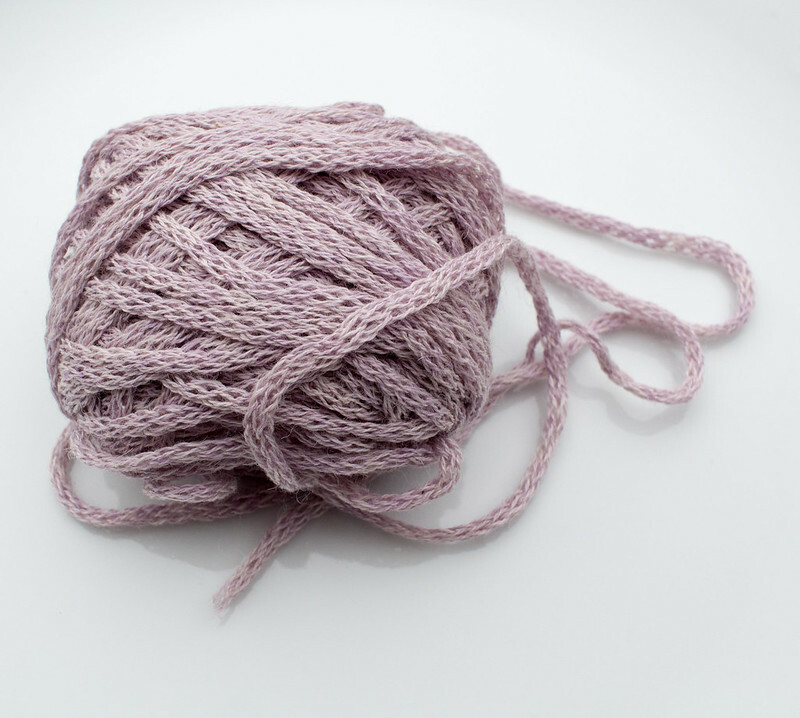 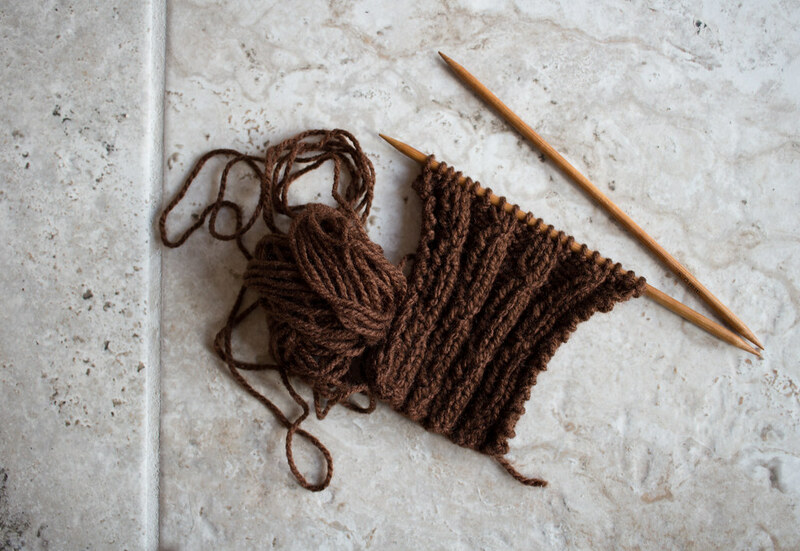 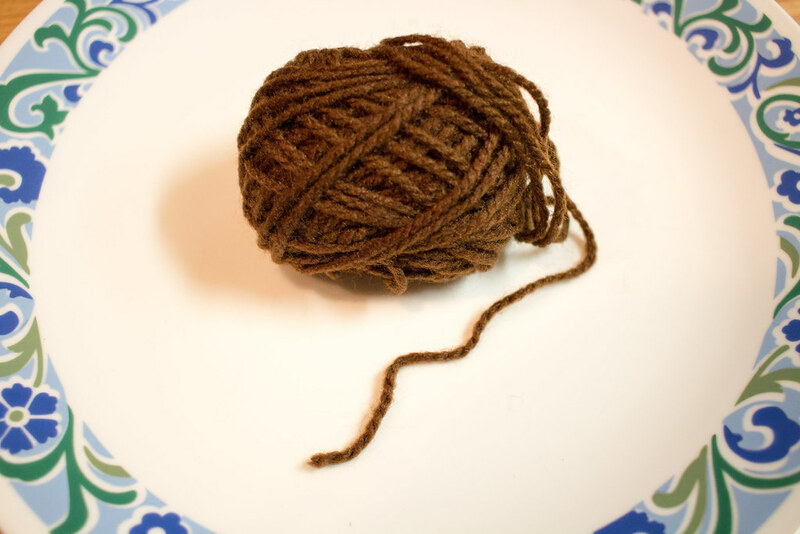 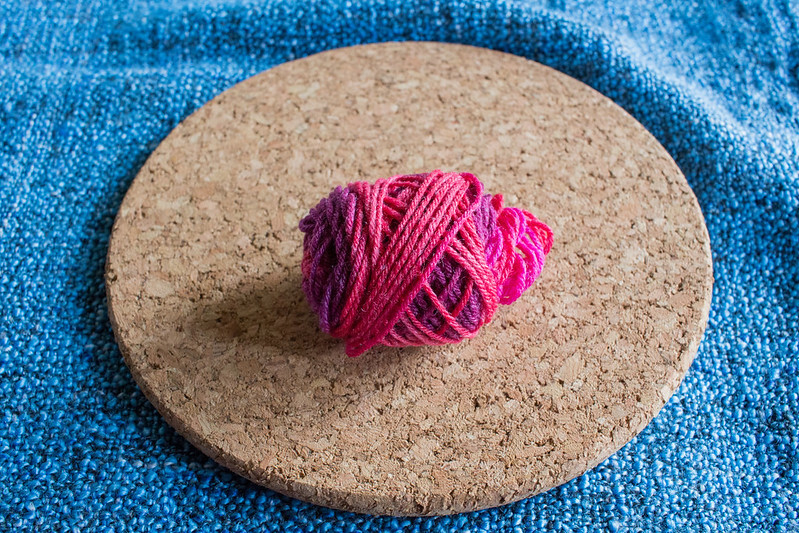 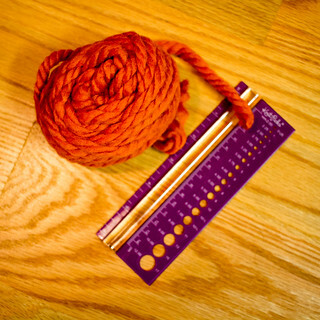 yarn of the month | Curiousity? 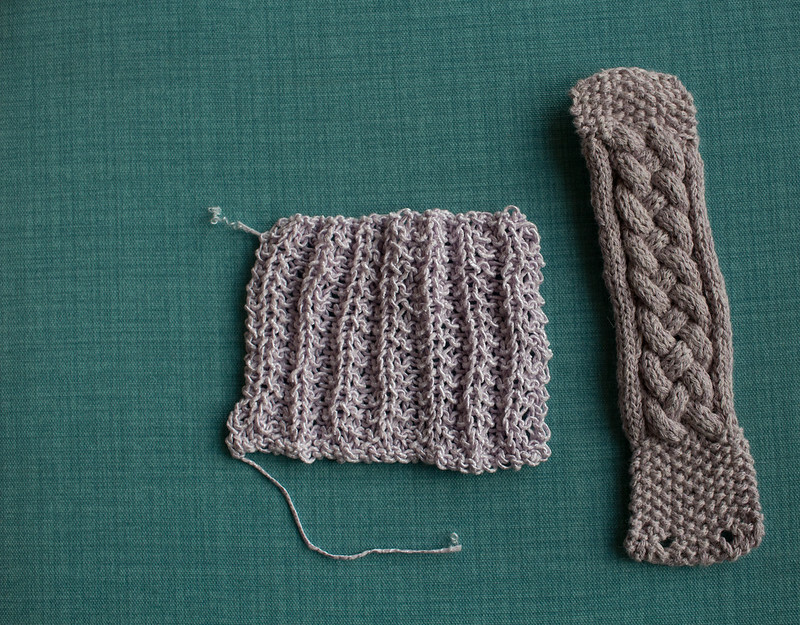 August’s colour scheme was a light lavender grey. 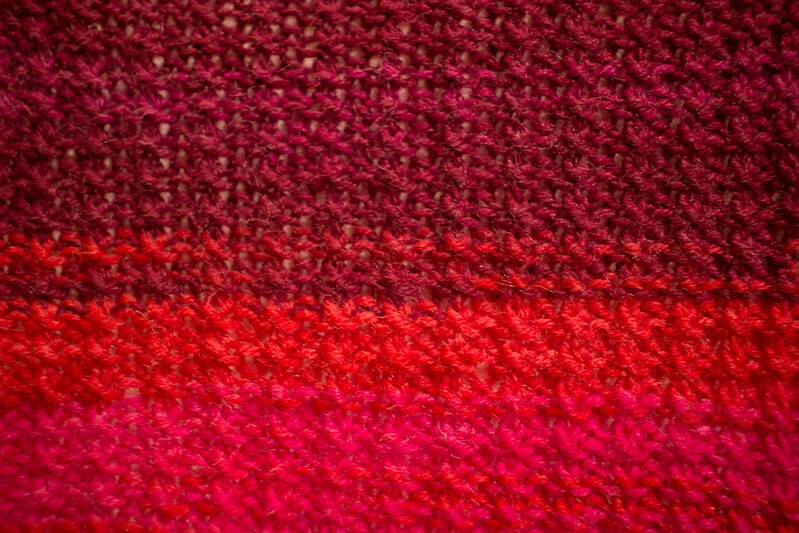 I decided to liven up some my photos a little, colour-wise, in part because I haven’t found my light box since the move, but also because I like a tad more colour in my selections. 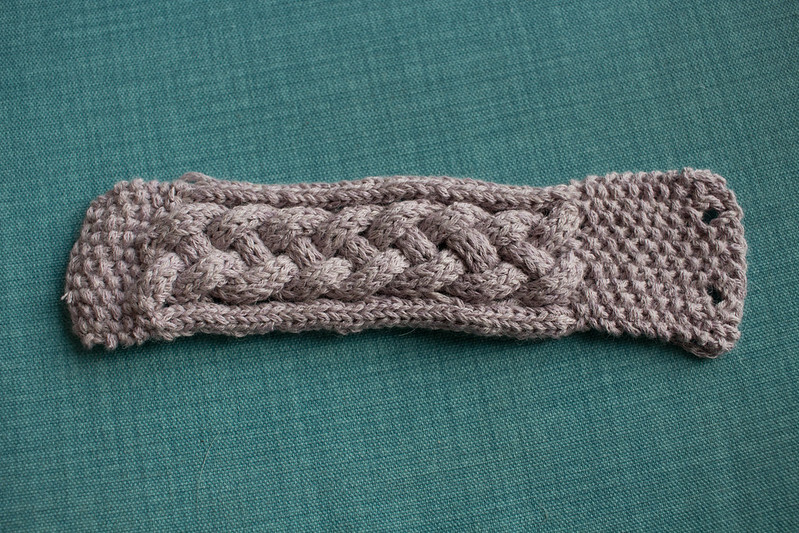 This month’s pattern was for a bracelet made of woven icord that was actually small enough to make with the sample, so I did that instead of the swatch. 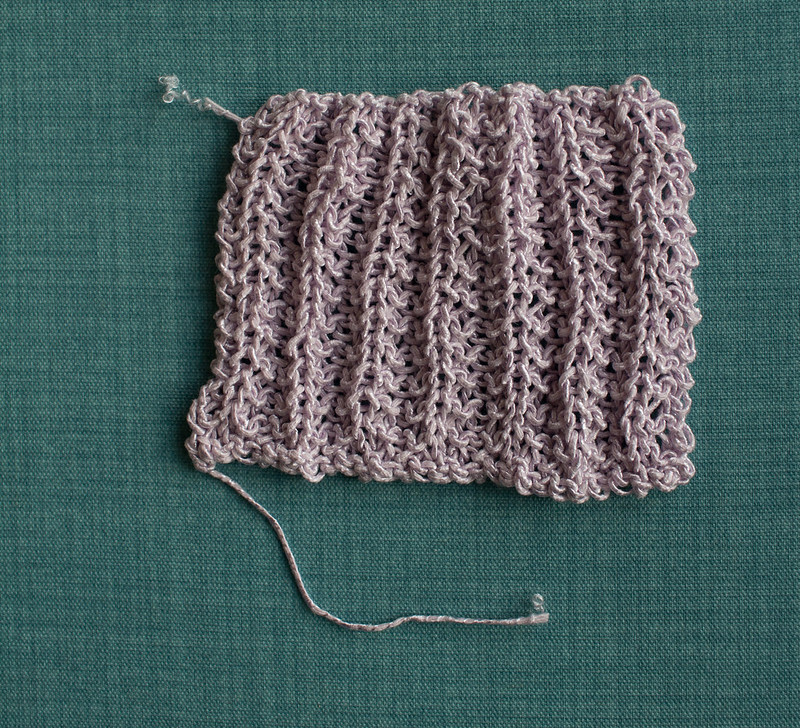 This was soft and nice to play with. 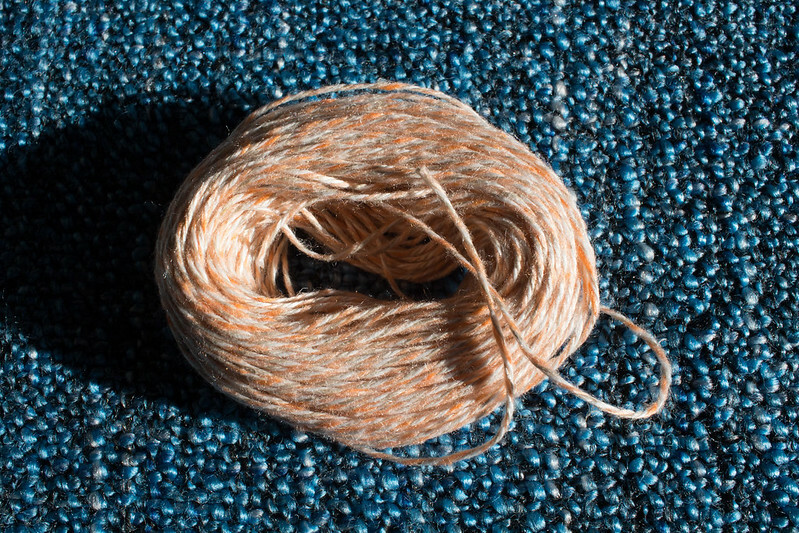 As is common with these chained yarns, I do have some trouble where I accidentally pull the individual threads and have to unknit and try again. 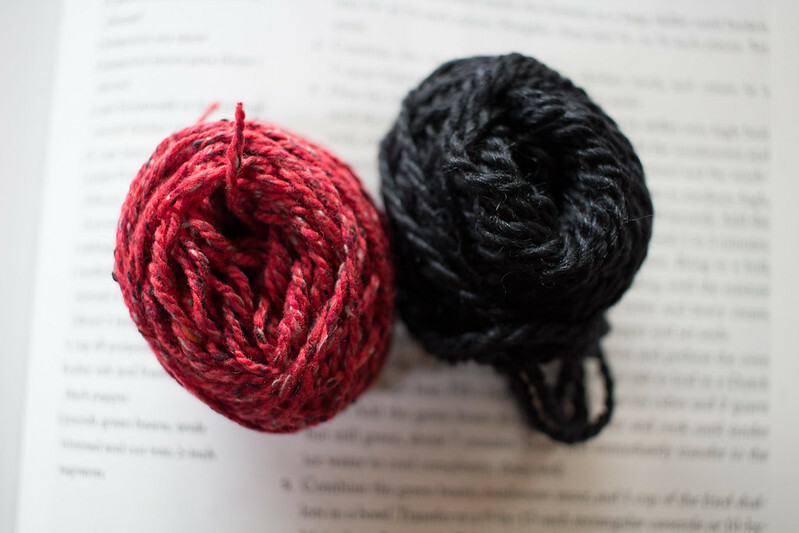 Definitely not yarn for knitting in a dark theatre or other time when you’re not looking at it. 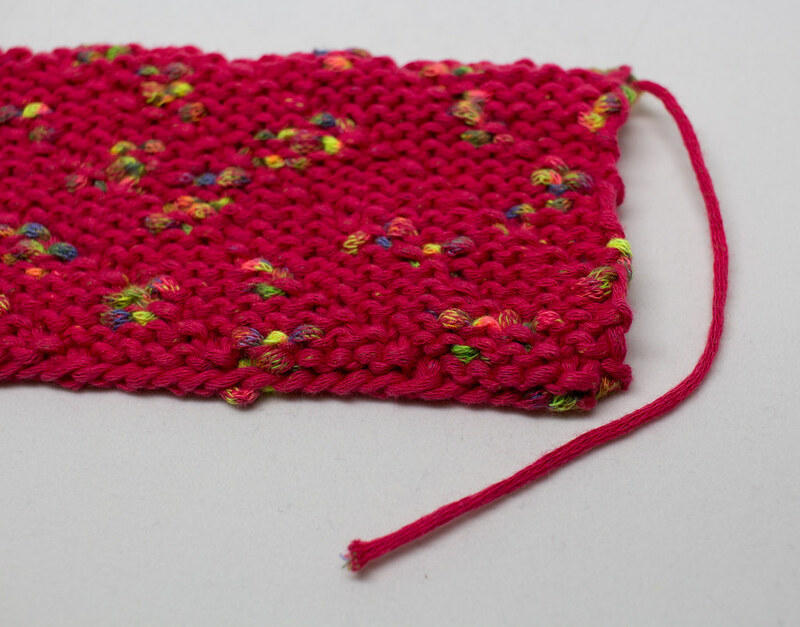 The pattern is a pretty cute little bracelet, made with a bunch of icord that you then weave together before picking up stitches and finishing the end. 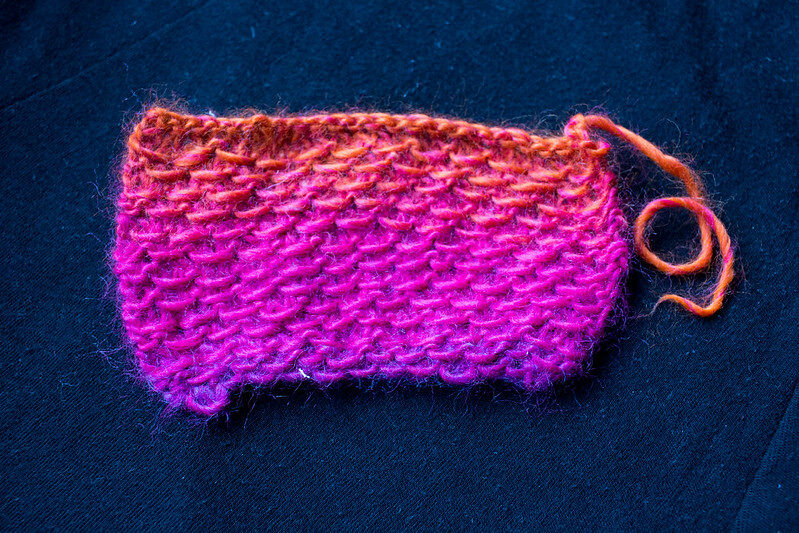 If I did it again, I’d probably leave off the side icords: they put them there so you could use them with beads, but since I don’t really like things clunking against my keyboard, I decided to leave my bracelet bare, and it was annoying to have to sew the side icords on to the center braid. 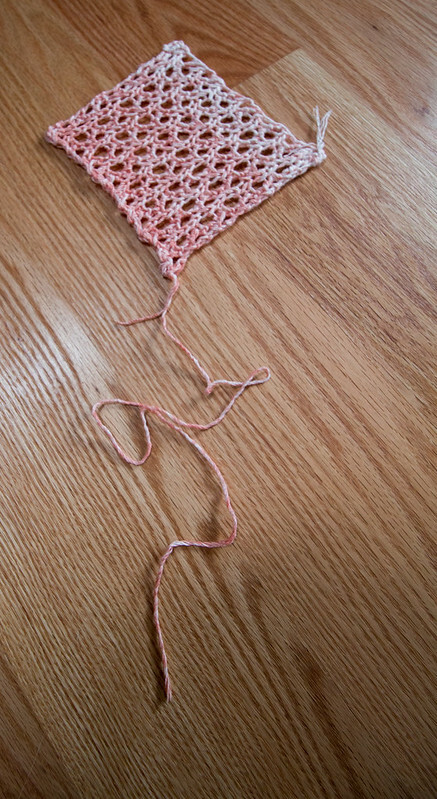 I think the structural integrity would be better without them if you’re not in it for the beads. 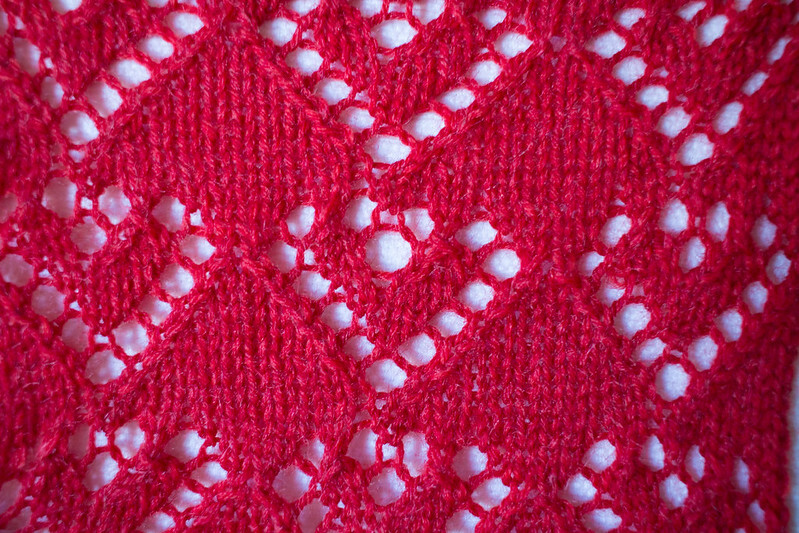 I haven’t dug out my buttons to finish it yet (they’re still buried in some box from the move), so I haven’t worn it. 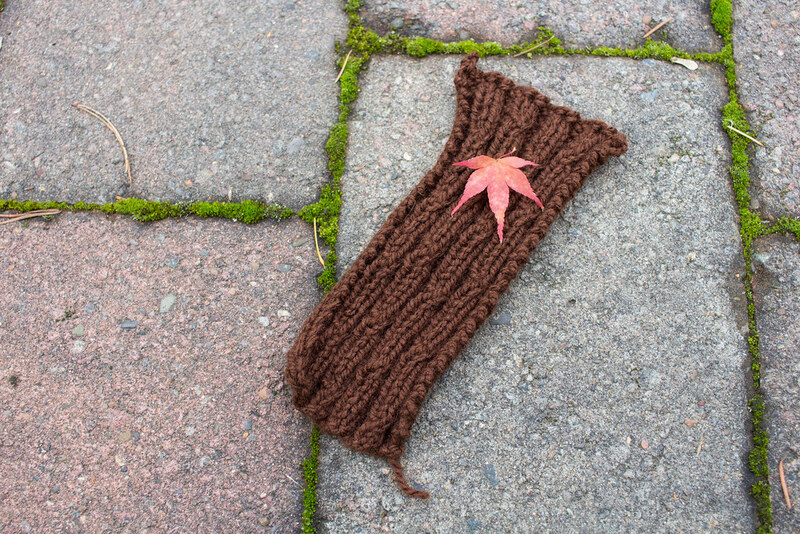 I strongly suspect it’ll wind up getting used as a coffee cup sleeve more often than it’ll get worn, since I rarely wear bracelets, but it’ll be nice and thick for holding hot beverages too. 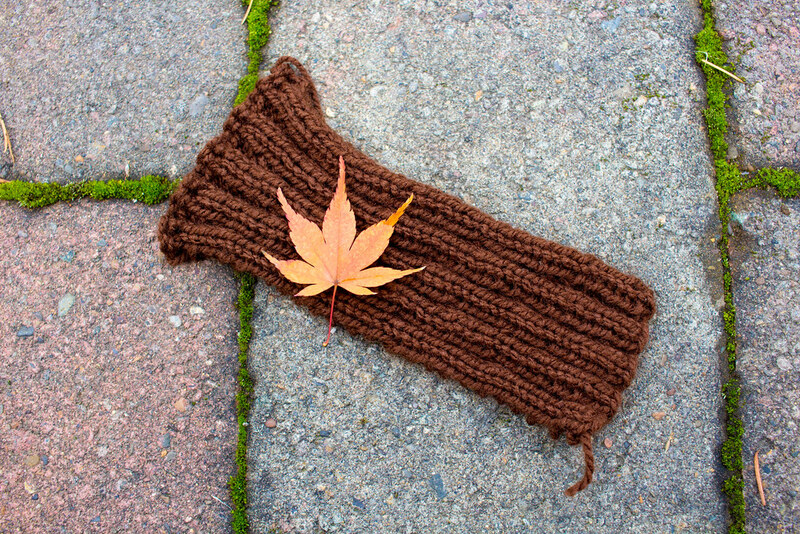 Maybe I should wear it just so I have it when I need it for hot beverage purposes? 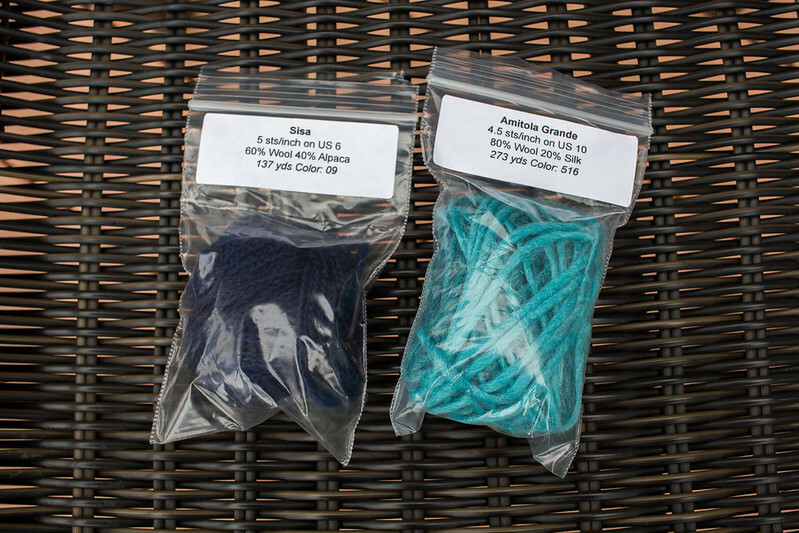 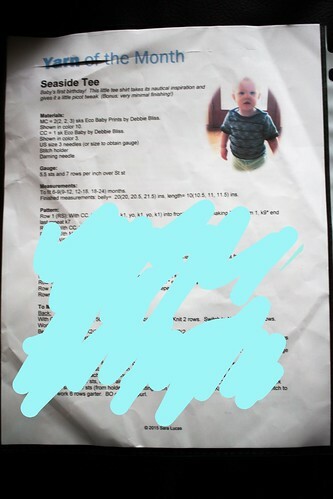 They are not kidding about this being slinky. 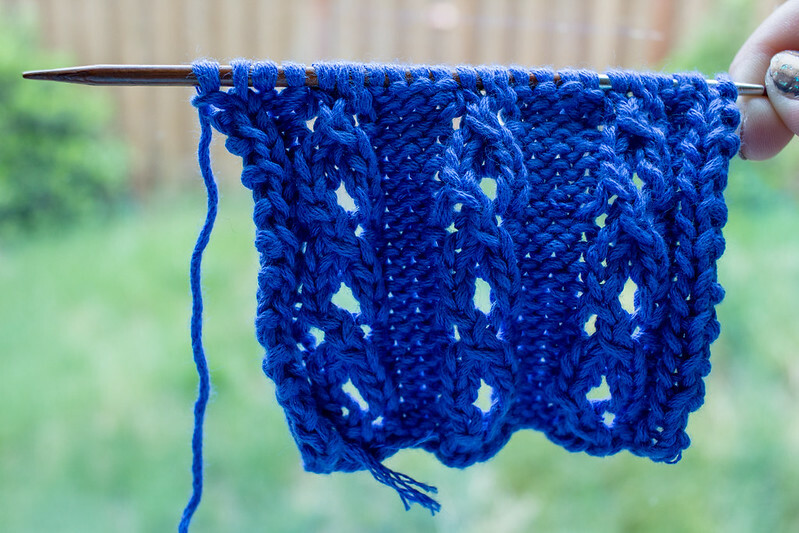 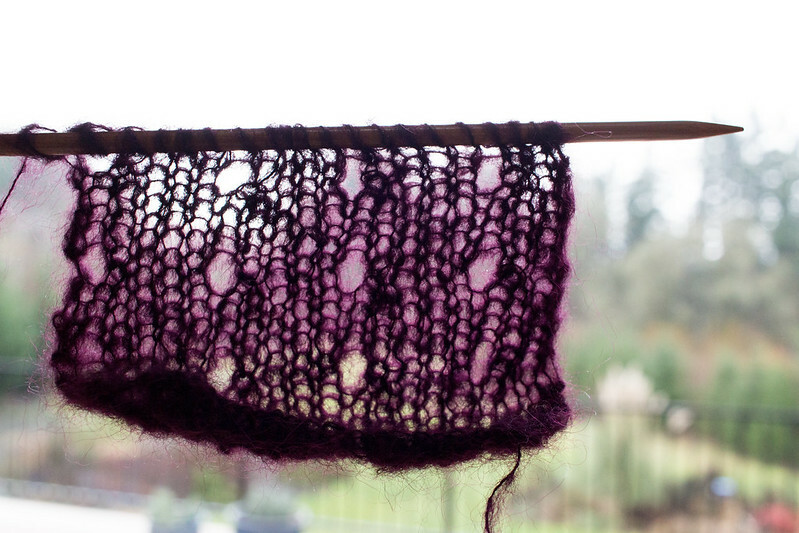 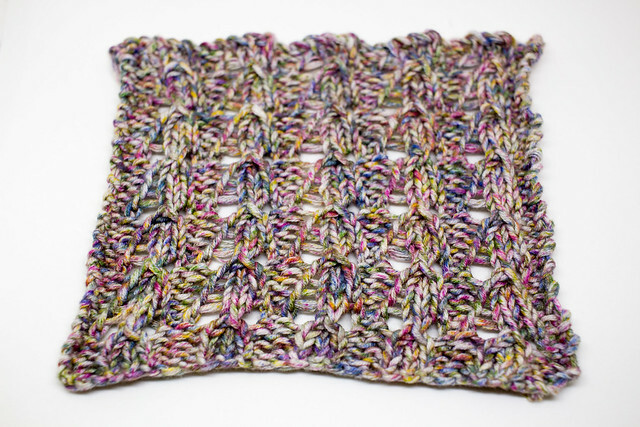 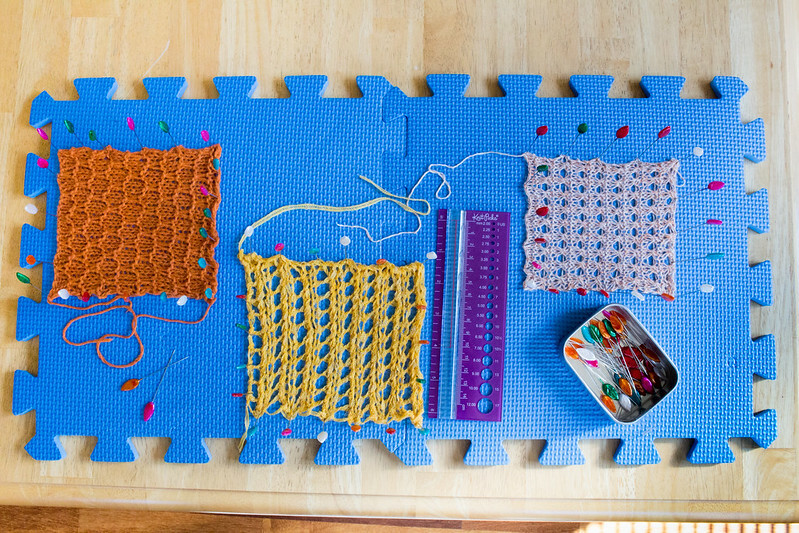 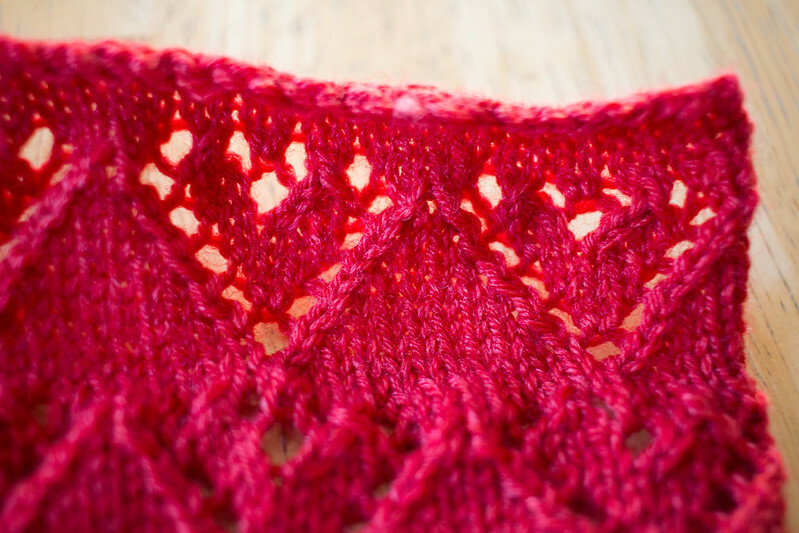 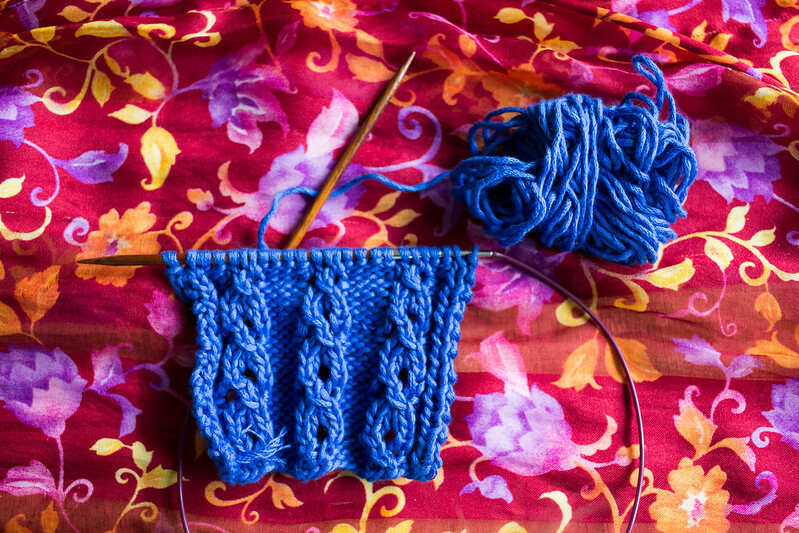 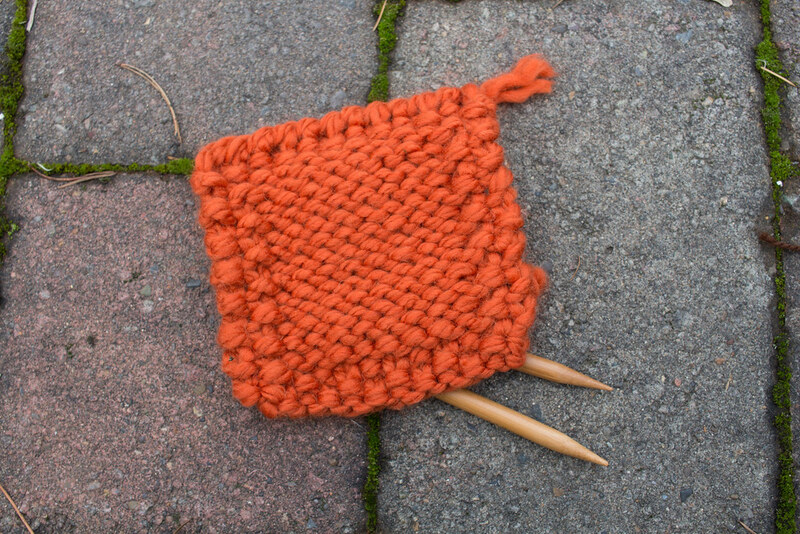 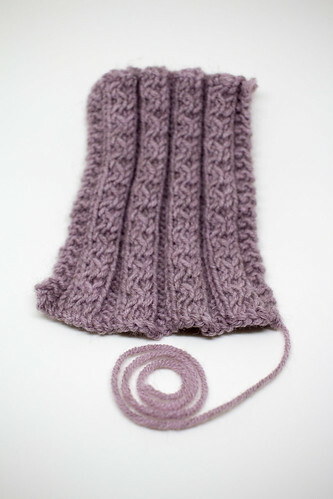 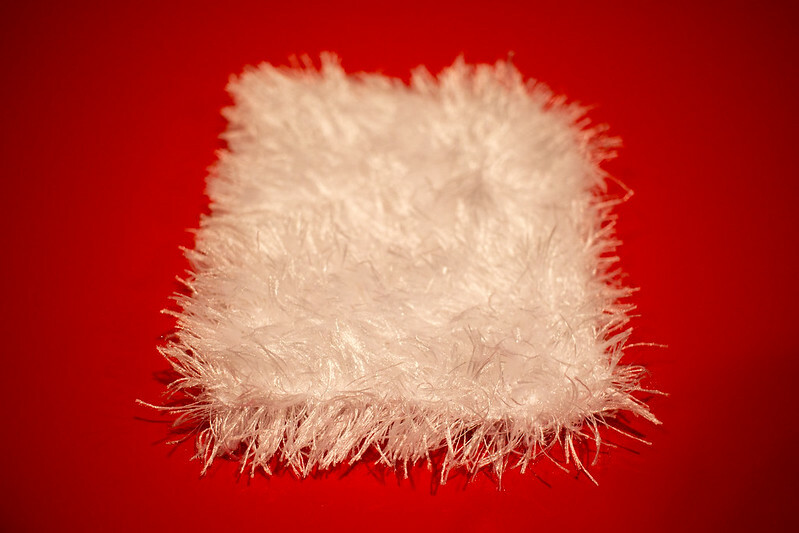 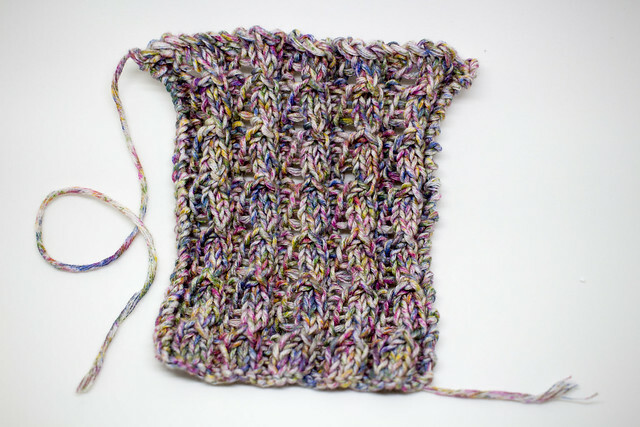 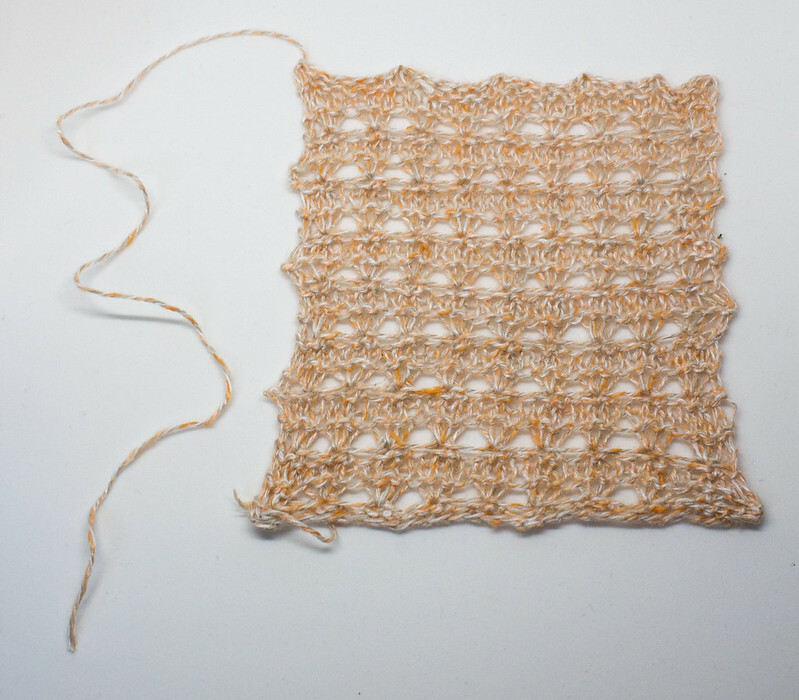 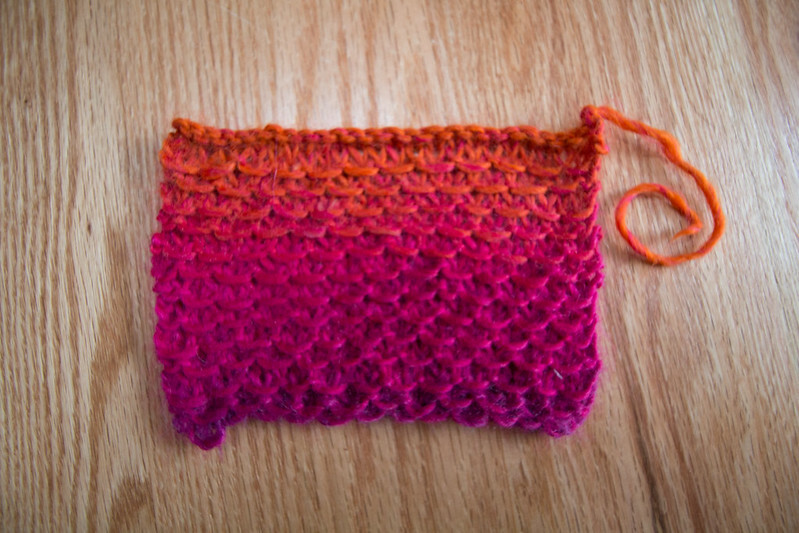 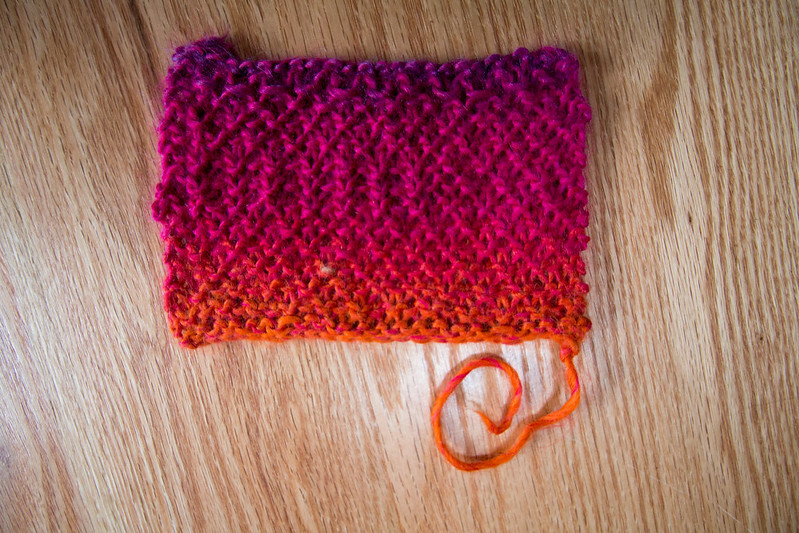 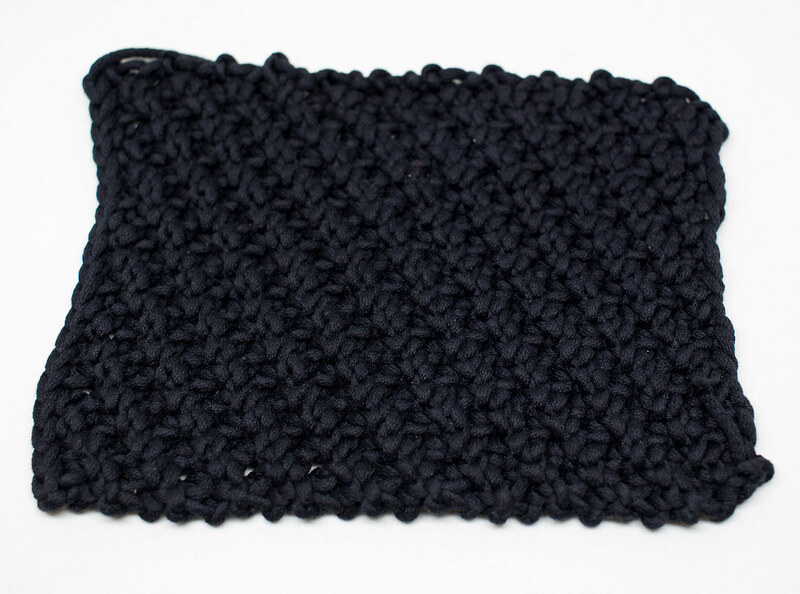 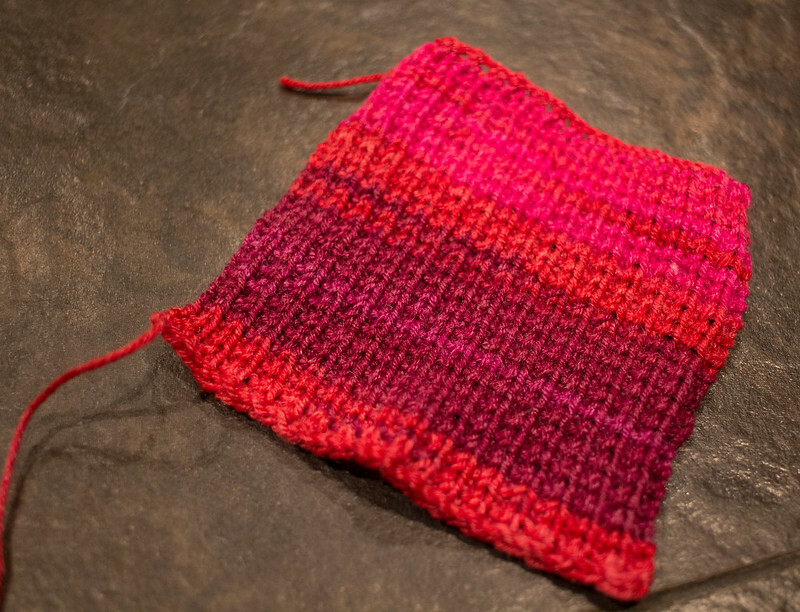 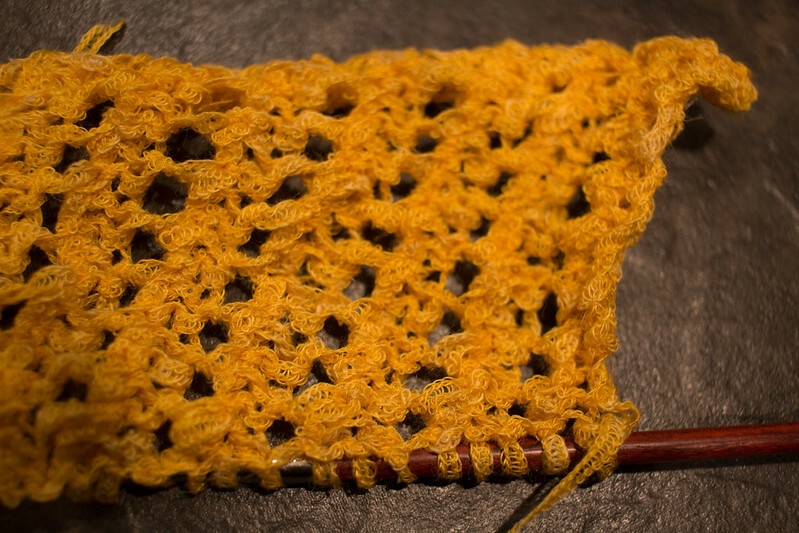 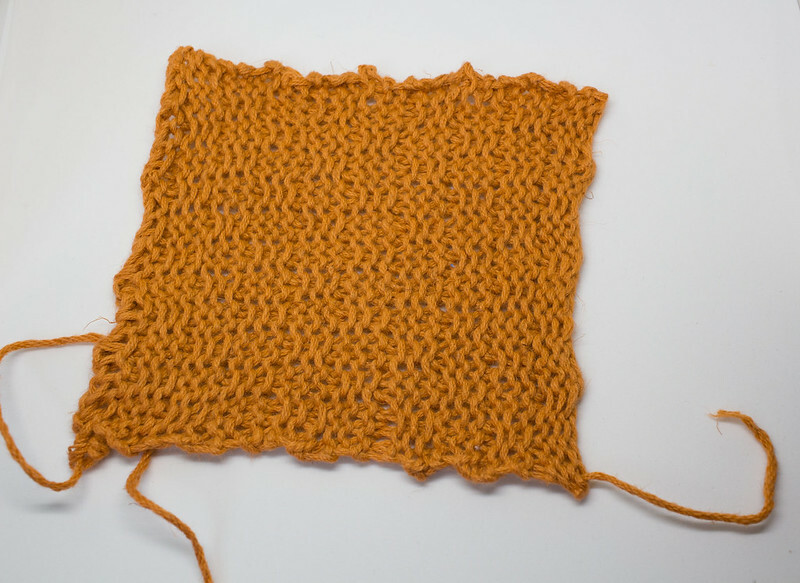 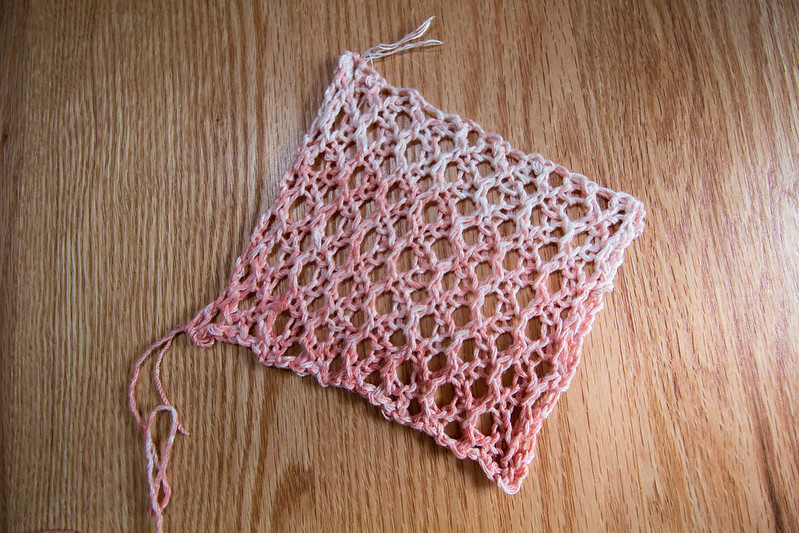 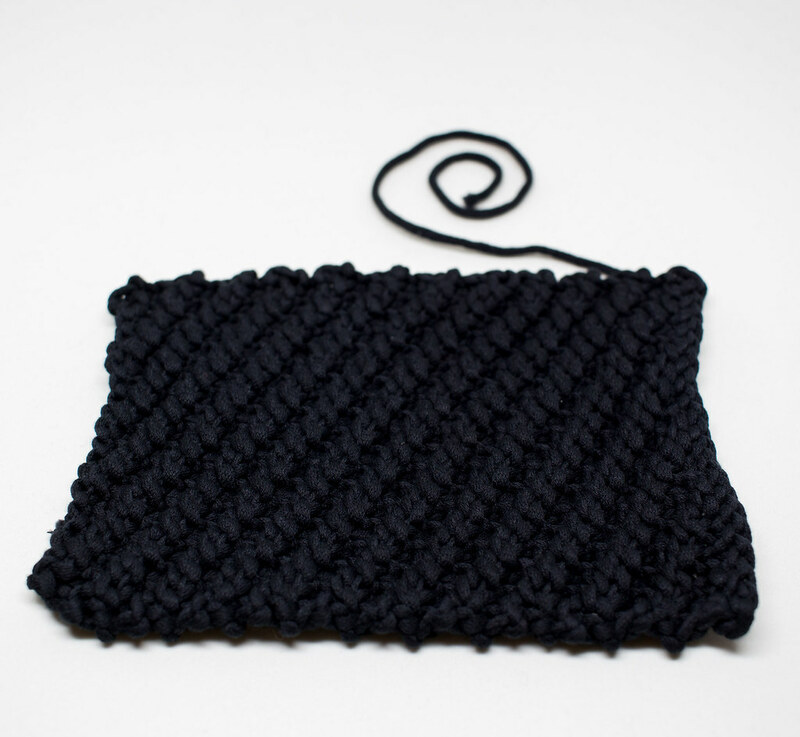 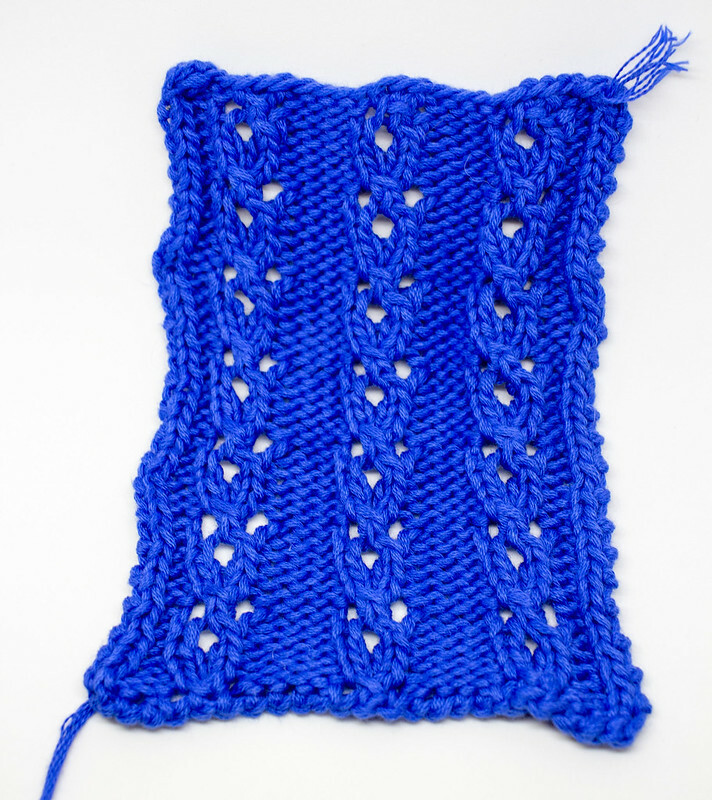 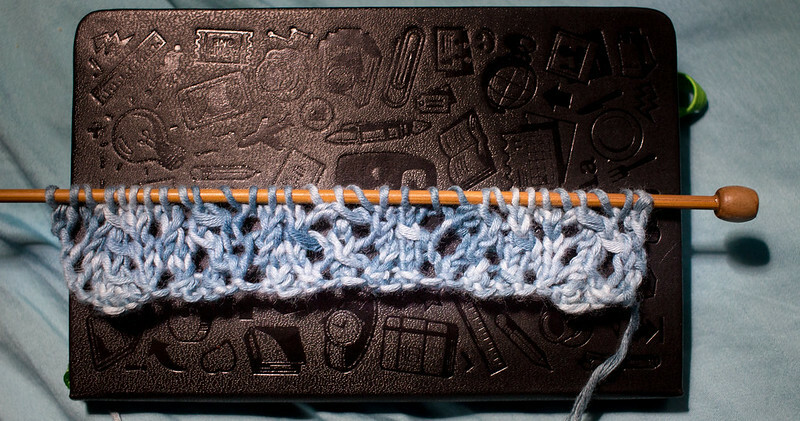 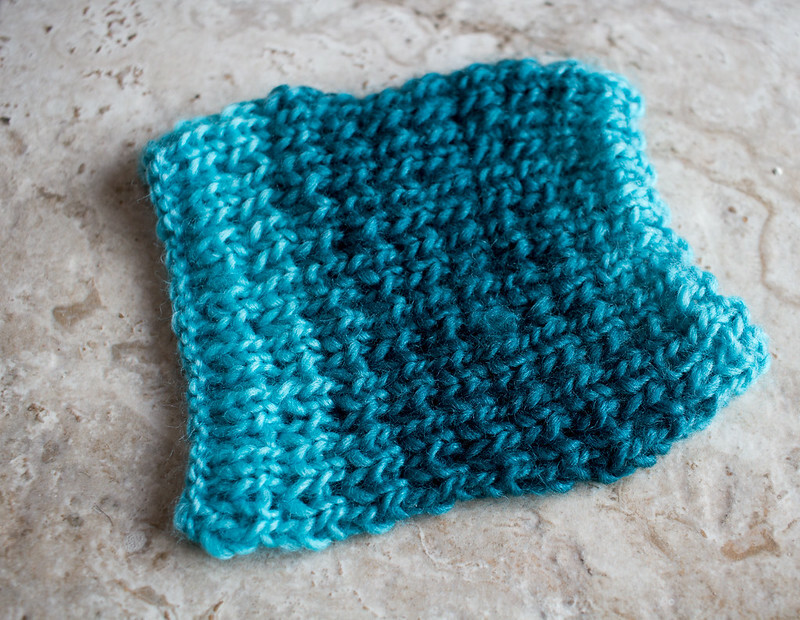 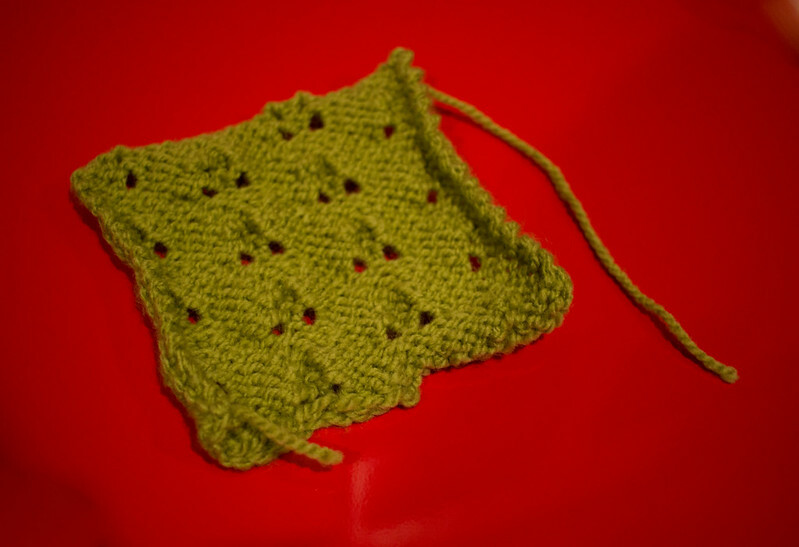 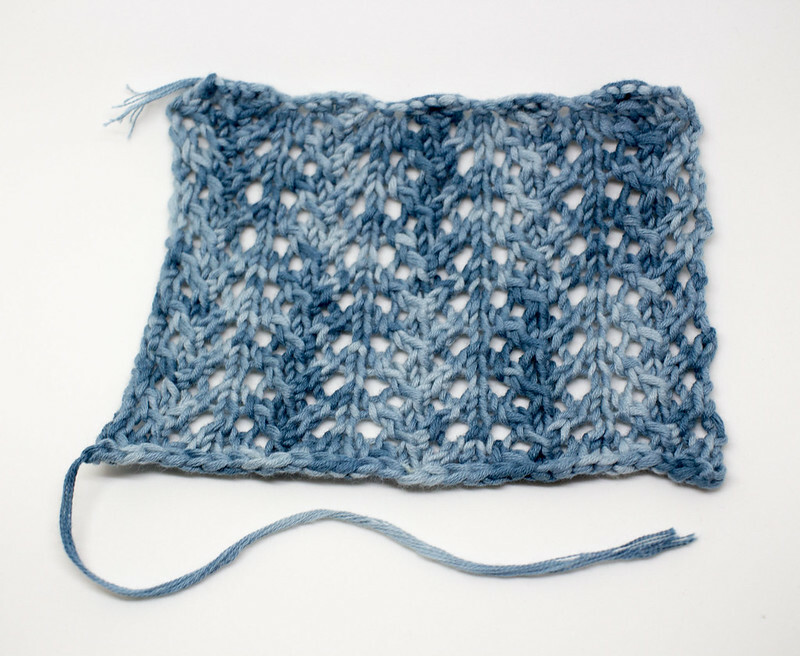 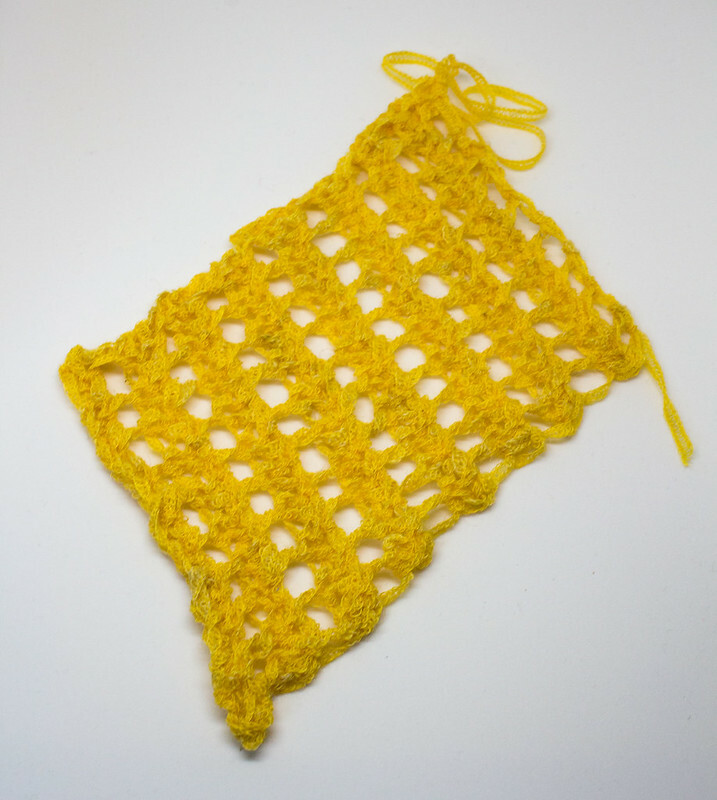 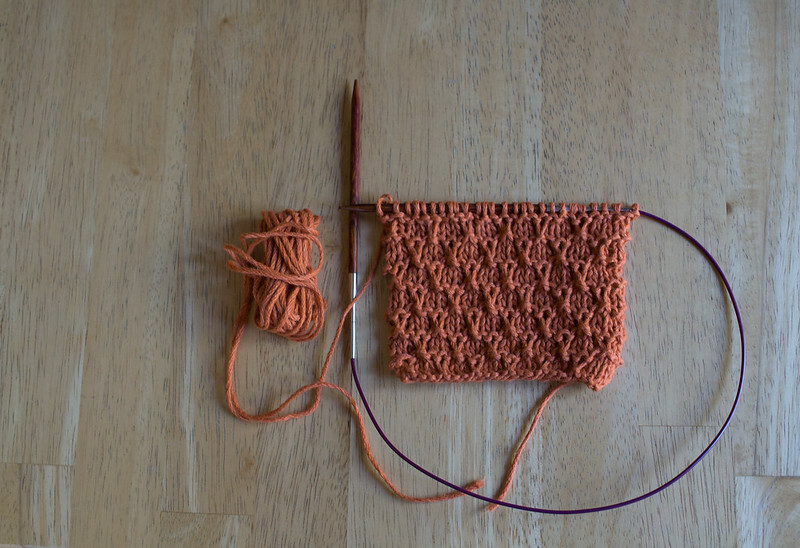 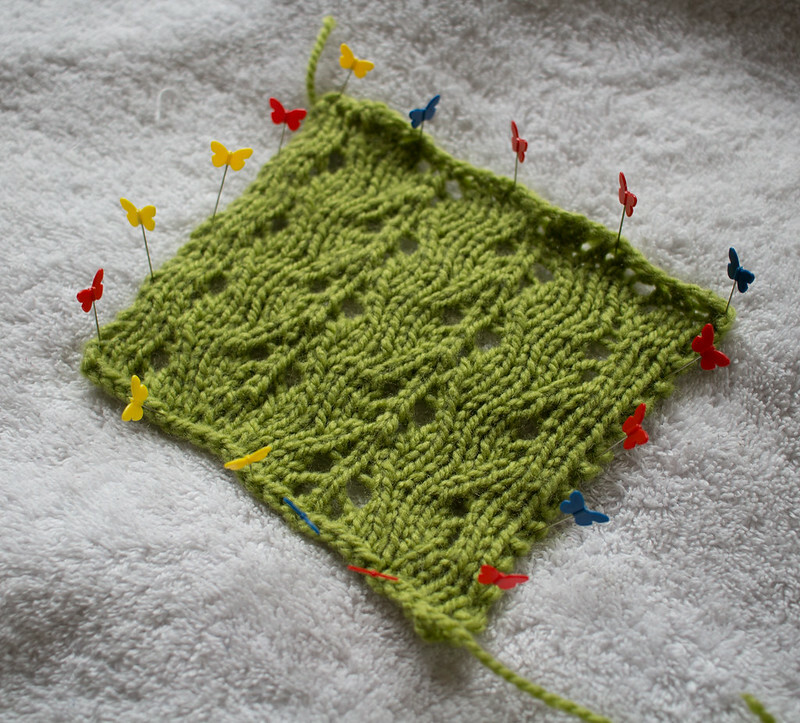 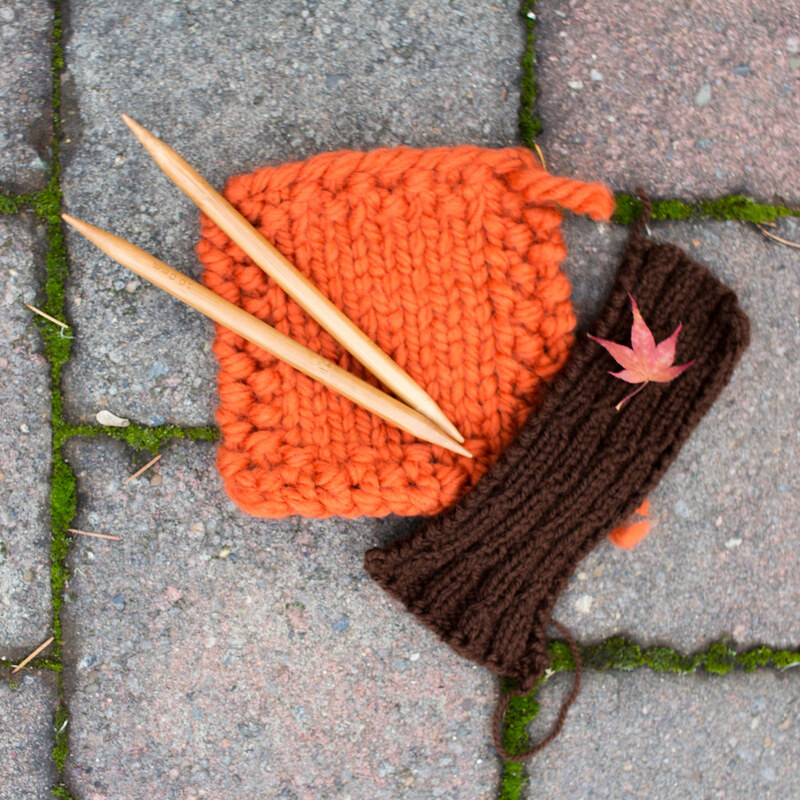 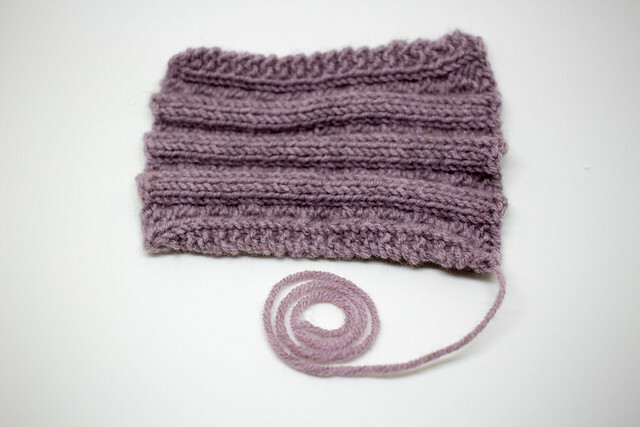 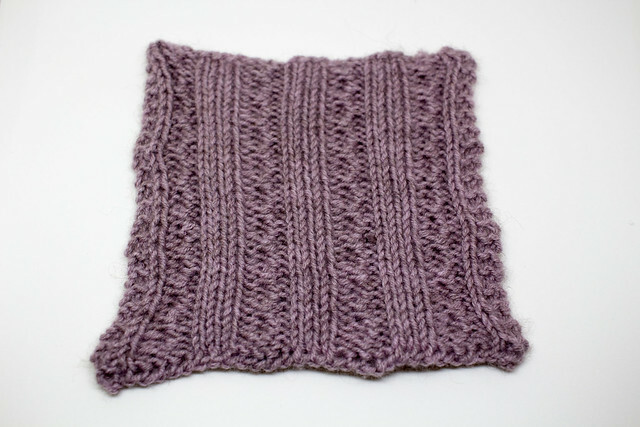 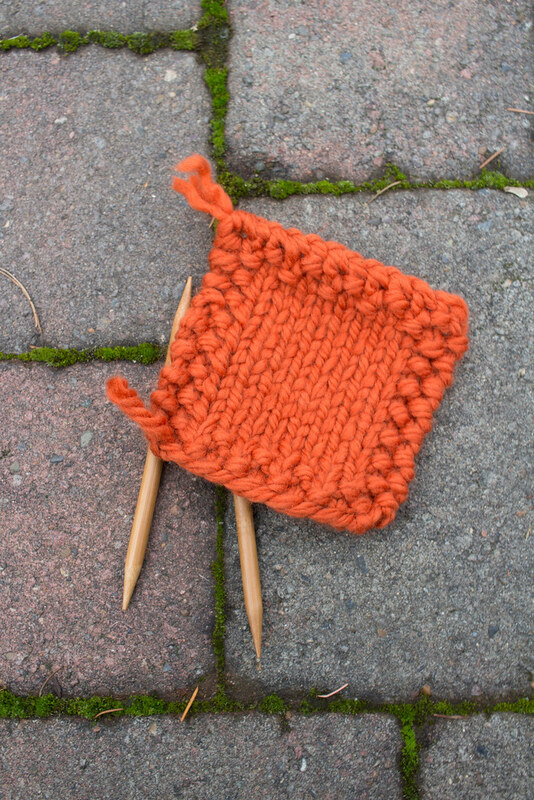 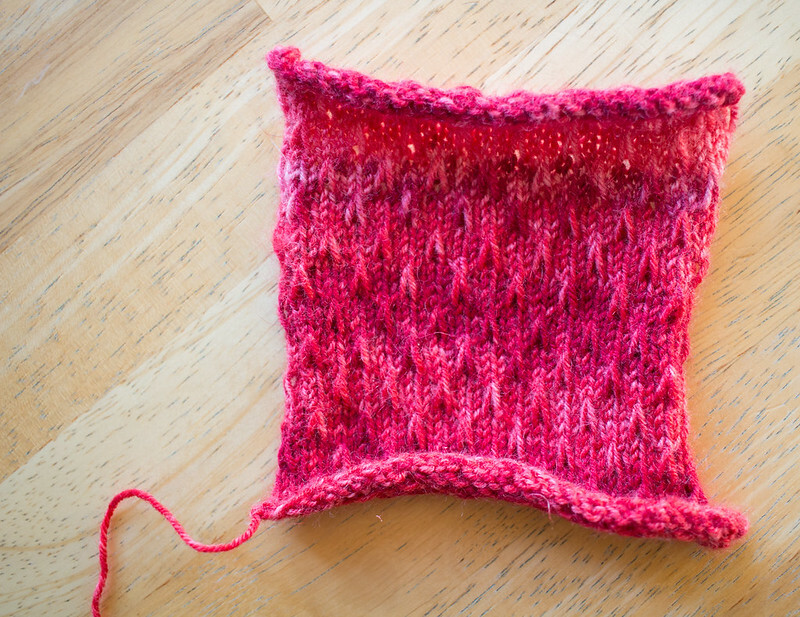 It’s a treat to work with, firm but slippery, and the swatch pattern shows it off nicely. 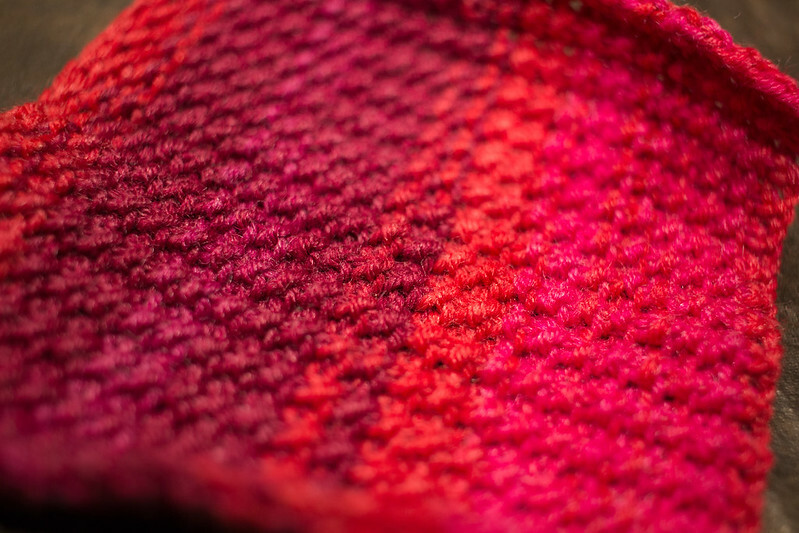 I can see this making a pretty neat summer scarf. 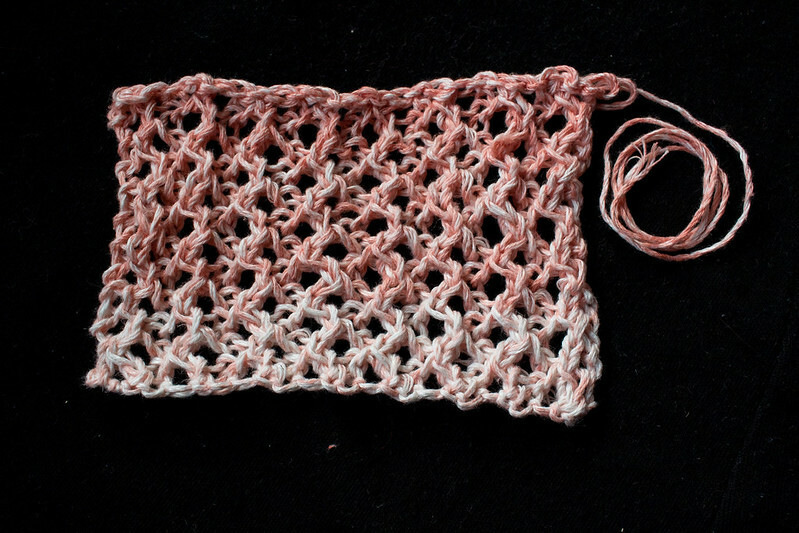 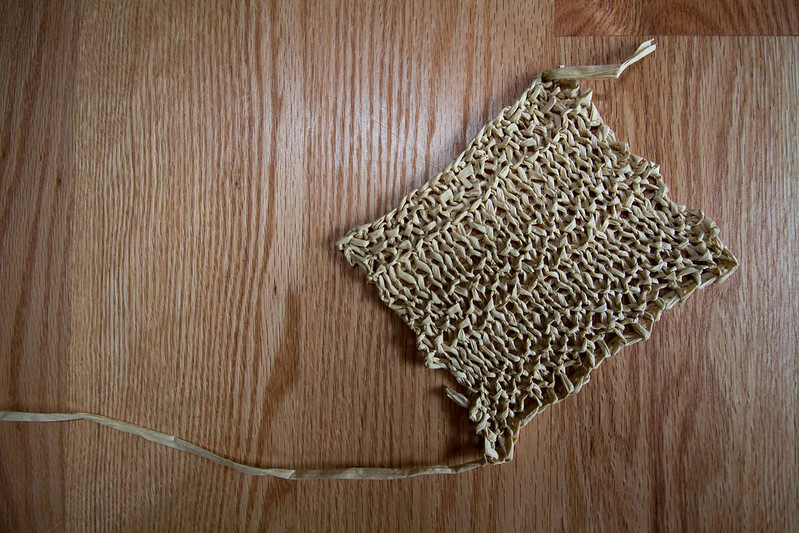 It’s got kind of a loose sliding chain feeling, satisfying to fiddle with, and the whole sample scrunches and stretches in a pleasant way. 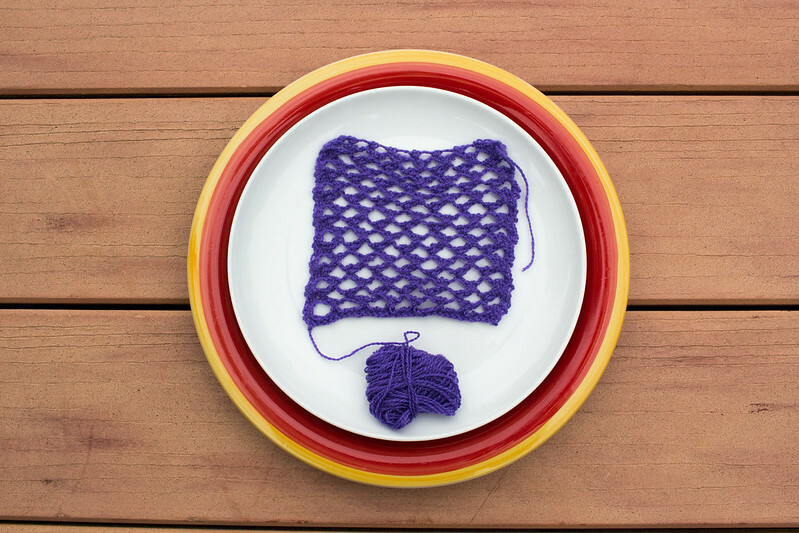 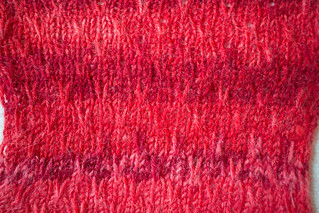 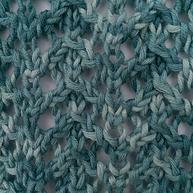 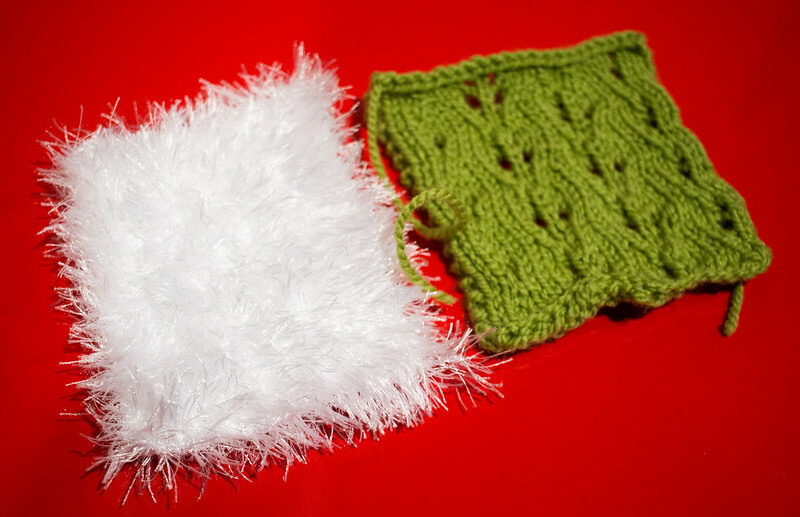 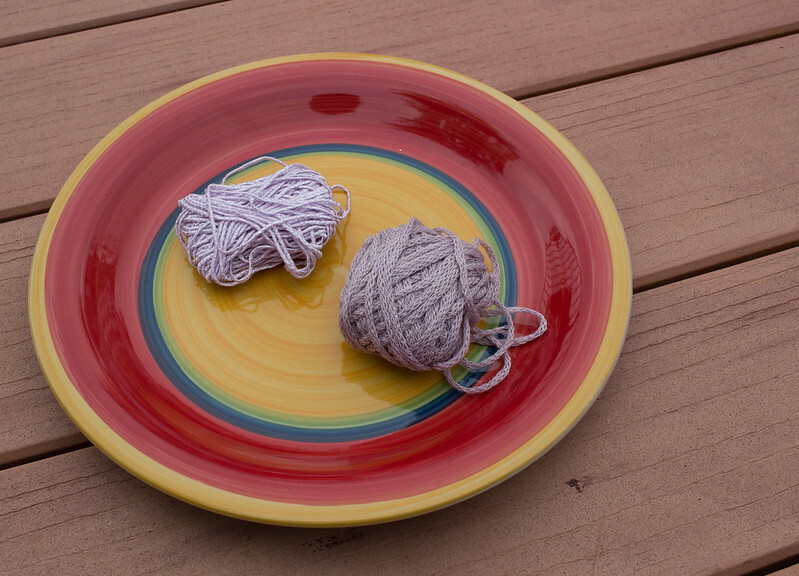 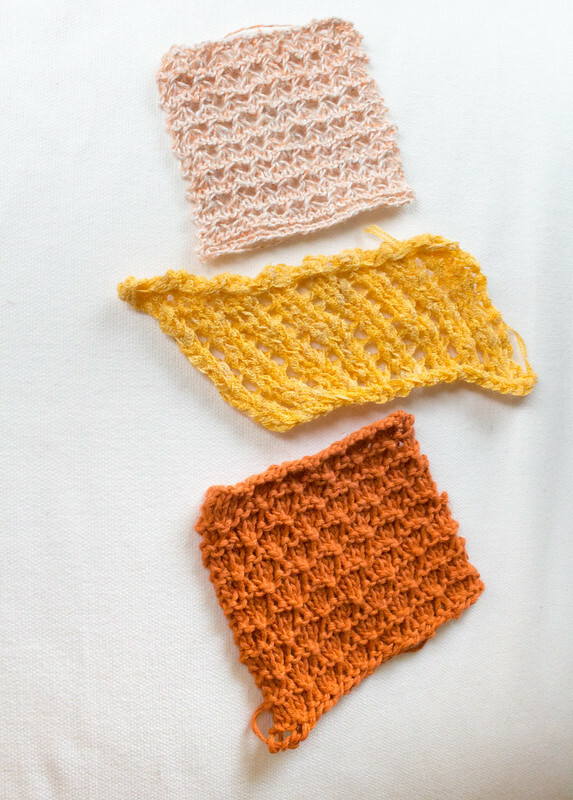 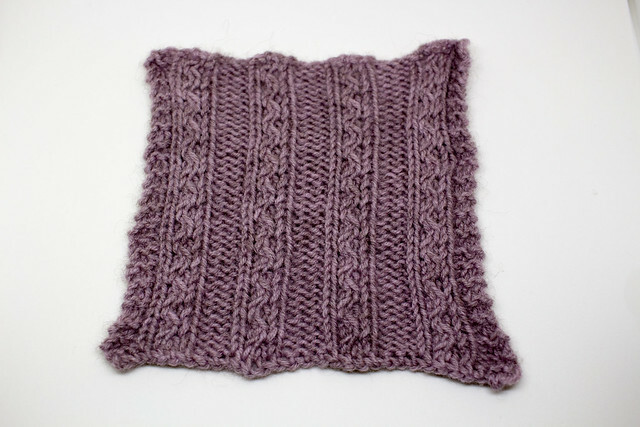 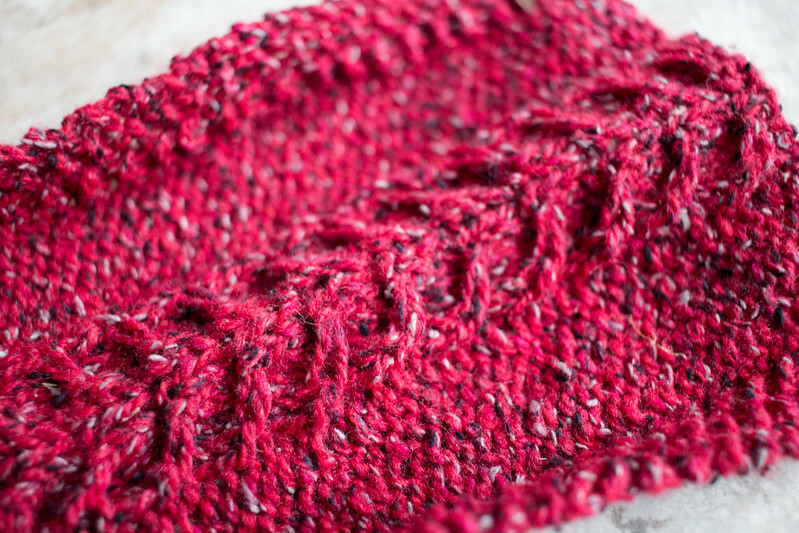 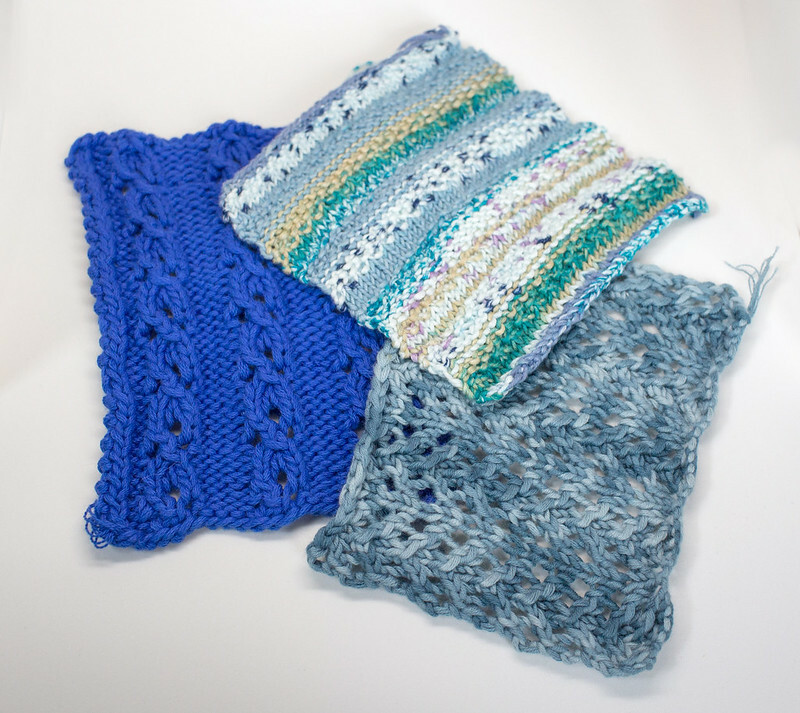 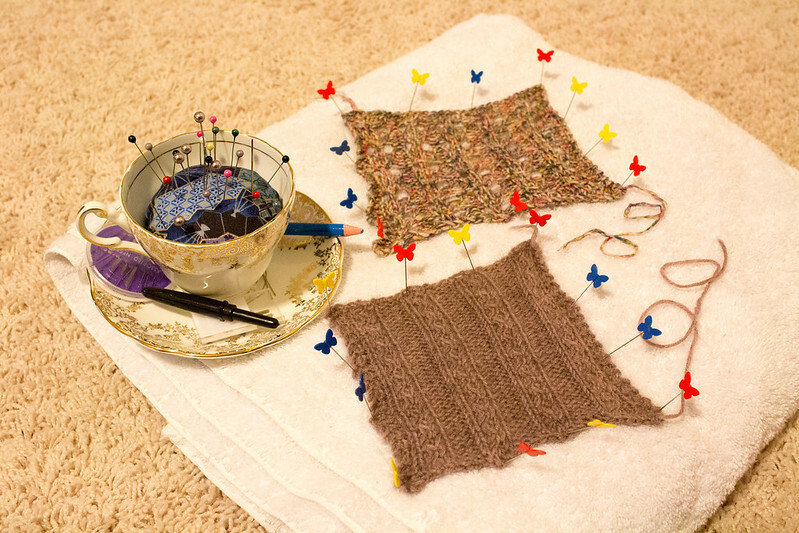 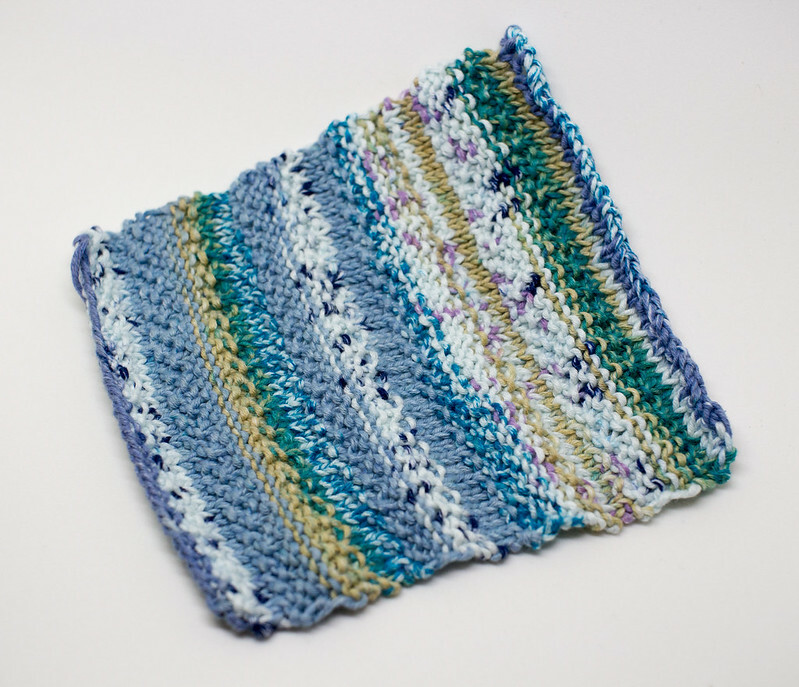 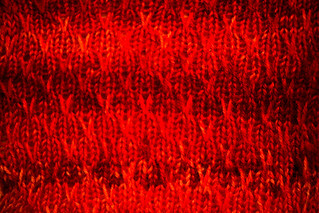 Two nice yarns and a fun pattern! 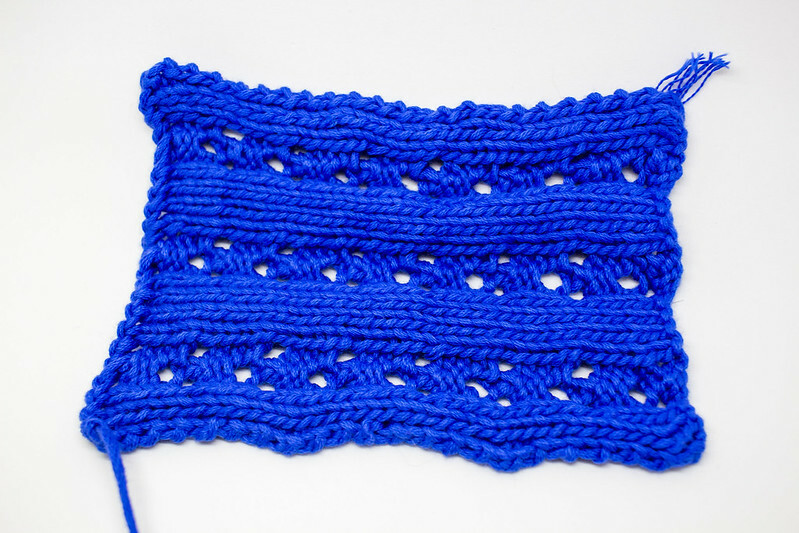 I don’t think I’d buy Maya again, because I’ve since worked with 100% alpaca in this chained format and I love it so much more, but it was good to try and a nice fit for the cuff pattern. 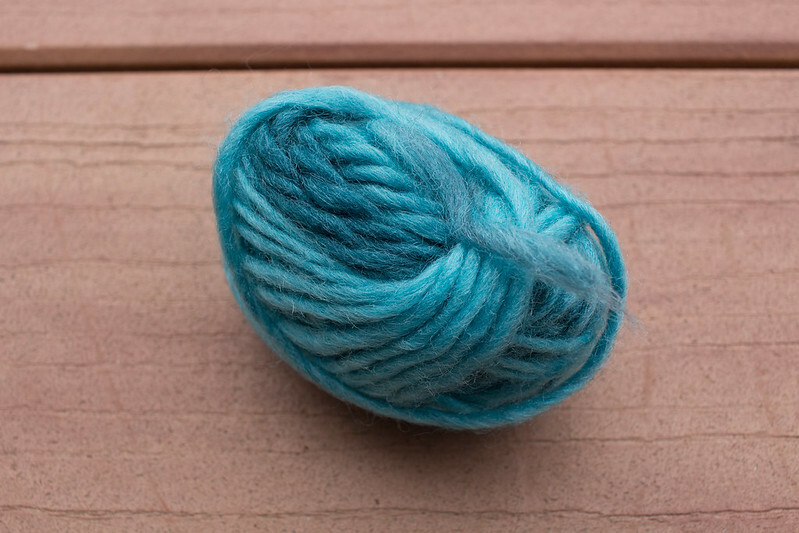 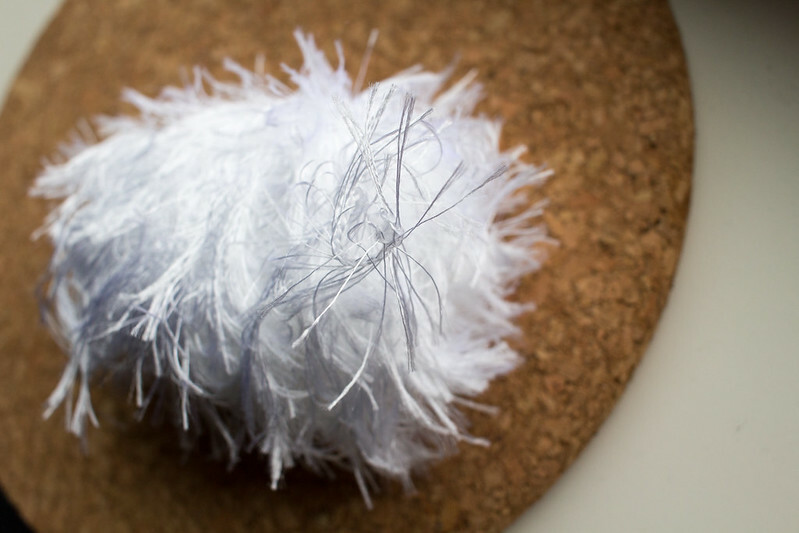 But I may pick up a ball of Captiva to make a scarf when I need something pretty for a present or something! 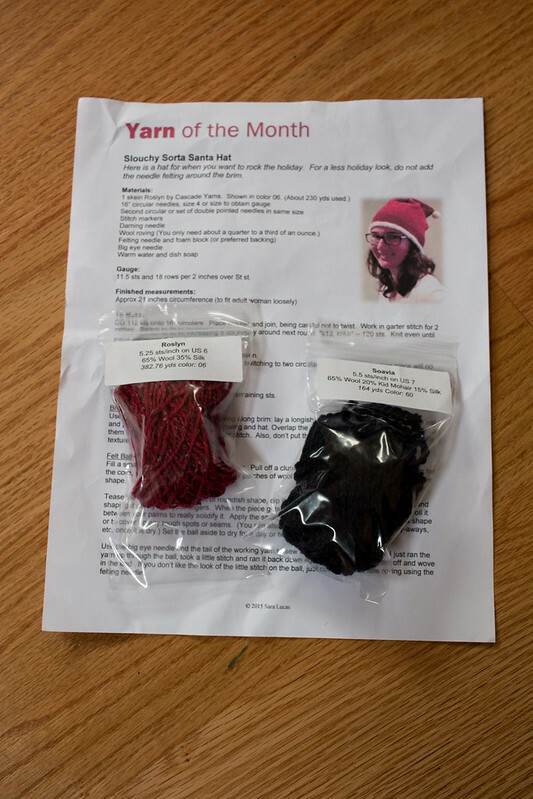 Posted in yarn of the month.